Here is a small amount of background information in order that you can understand the nature of this “Practical Guide to Free-Energy Devices”. I am just an ordinary person who became interested in “free-energy” as a result of a television programme entitled ‘It Runs on Water’ shown in the 1980s by a UK television company called ‘Channel 4’. This programme has since been put on the internet and at this time can be seen here. From my point of view, the content of this documentary seemed to be rather unsatisfactory as it suggested quite a number of very interesting things but gave no real hard and fast specifics for the viewer to follow up on to investigate the subject further. However, it had the enormous benefit of making me aware that there was such a thing as “free-energy”. My attempts to find out more were not very successful. In 1986 I bought paper copies of several of Stan Meyer’s hydroxy gas patents from the Patent Office but while they were interesting, they did not provide much in the way of additional information. Searching on the internet at that time did not produce much more in the way of practical information. Things have changed dramatically since then and there has been an enormous increase in available information. But, even today, it is relatively difficult to find direct, useful and practical information on free-energy systems and techniques. Much of the information consists of chatty, lightweight articles describing people, events and inventions in vague, broad outline terms which are almost completely lacking in specifics. These articles have the style of saying “There is a new invention called a ‘bus’ which is used to carry passengers from place to place. We saw one the other day, it was painted green and blue and looked most attractive. It is driven by Joe Bloggs who wears an engaging smile and a hand-knitted sweater. Joe says that even his children could drive a bus as it is so easy to do. Joe expects to retire in six months time as he is going to take up gold prospecting.” While I’m sure that an article like that is interesting, the sort of description which I would want would be: “There is a new invention called a ‘bus’ which is used to carry passengers from place to place. We saw one the other day, and were very impressed as it has seats for some forty-five people. It has bodywork made of pressed aluminium, a wheel at each corner of its considerable 40’ x 10’ structure, a five litre diesel engine made by the Bosworth Engineering Company of Newtown, and has power-assisted steering, hydraulic brakes and ……”. There are also many articles, scientific papers and books which, quite frankly, I am not able to understand as the authors think mathematically and express themselves in equations (where they frequently do not define the terms which they use in their equations, making them effectively meaningless). I do not think in mathematical equations, so I do not share in this much higher level of thinking and analysis, though I do have some of these papers on my web site for the benefit of visitors who do have the ability to understand them easily. After a long period of searching and investigating I was beginning to gather enough information to be fairly confident of what was being done, what had already been achieved, and some of the possible background reasons for the effects which were being observed. Early in 2005 I decided that as I had encountered so much difficulty and had to put in so much effort to find out the basics of “free-energy” that it could be helpful to others if I shared what I had found out. So I wrote the first edition of this presentation and created a simple web site to make it available to others. Of course, this body of information is not static – on the contrary, it is very fast-moving. Consequently, this information digest is updated and refined typically once or twice per week. The present form of presentation is the third style of layout which has been used as the volume of material has increased. It should be stressed that this information is what I have discovered as part of my interest in the subject and is mainly a reporting on what is being said by other people. I have not built and proved every device described – to do that would take many lifetimes, so please understand that this is just an attempt to aid your own investigation. While it can be proved that some device works as described, through independent replication and verification, the reverse is not true. If someone were to build a device and fail to get it to work as described, then the most that can honestly be said is that an unsuccessful attempt was made to replicate it. It does not, of course, show that the original device did not operate exactly as described, just that the (possibly inept) attempt at replication, was not successful. In some instances, you will see that I have expressed the opinion that the device is not viable, or, as in the case of the ‘Nitro Cell’ that I do think that it does work, but as many people have tried to build it and failed to get the results described, that it can’t be recommended as an investigation project. I do not suggest that this set of information covers every possible device, nor that my description is by any means the complete and definitive statement of everything to be known on the subject. The old saying applies here: “If you think you know all the answers, then you just haven’t heard all the questions!” So, this material is just an introduction to the subject and not an encyclopedia of every known device. I should like to thank the very large number of people who have most kindly given me their permission to reproduce details of some of their work, providing photographs, checking what I have written, suggesting additions, etc. Also those kind people who have given me permission to reproduce their own works directly on my web sites or in my documents. There seems to be a common thread of concern among many people that shows as a desire to share this information freely rather than to try to make money from selling it, and I thank these people for their generosity. Many people hold “conspiracy theory” views and believe that there is a concerted effort to suppress this information, and more especially, to prevent free-energy devices reaching the market. Personally, I think that the bulk of this opposition is just the normal reaction of vested commercial interests. If you were making a profit of literally millions per hour, would you welcome the introduction of a system which would eventually cut your income to zero? If not, then how much would you be willing to pay someone to make sure that the present system is never changed – a million? A billion? While this opposition is definitely there and people who stand to lose money and/or power through change will continue to oppose this knowledge, and to a much greater extent, the introduction of any commercial free-energy device, this is not something which I feel is immediately relevant to this presentation, and so almost the entire focus of the information is on devices – what they do, how they are made and how they may operate when they draw additional energy from the local environment. Let me stress again, that this set of information is not by any means the final word on the subject, but just an introduction to the subject by a single person who makes no claims to knowing all the answers. Enjoy your research – I hope you are successful in every respect. This document contains most of what I have learned about this subject after researching it for a number of years. I am not trying to sell you anything, nor am I trying to convince you of anything. When I started looking into this subject, there was very little useful information and any that was around was buried deep in incomprehensible patents and documents. My purpose here is to make it easier for you to locate and understand some of the relevant material now available. What you believe is up to yourself and none of my business. Let me stress that almost all of the devices discussed in the following pages, are devices which I have not personally built and tested. It would take several lifetimes to do that and it would not be in any way a practical option. Consequently, although I believe everything said is fully accurate and correct, you should treat everything as being “hearsay” or opinion. Some time ago, it was commonly believed that the world was flat and rested on the backs of four elephants and that when earthquakes shook the ground, it was the elephants getting restless. If you want to believe that, you are fully at liberty to do so, however, you can count me out as I don’t believe that. The Wright brothers were told that it was impossible for aeroplanes to fly because they were heavier than air. That was a commonly believed view. The Wright brothers watched birds flying and since, without question, birds are considerably heavier than air, it was clear that the commonly held view was plain wrong. Working from that realisation, they developed aeroplanes which flew perfectly well. The years passed, and the technology started by the Wright brothers and their careful scientific measurements and well-reasoned theory, advanced to become the “science” of aeronautics. This science was used extensively to design and build very successful aircraft and “aeronautics” gained the aura of being a “law”. Unfortunately, somebody applied aeronautic calculations to the flight of bumblebees and discovered that according to aeronautics, bumblebees couldn’t possibly fly as their wings could not generate enough lift to get them off the ground. This was a problem, as it was perfectly possible to watch bees flying in a very competent manner. So, the “laws” of aeronautics said that bees can’t fly, but bees actually do fly. Does that mean that the laws of aeronautics were no use? Certainly not - those “laws” had been used for years and proved their worth by producing excellent aircraft. What it did show was that the “laws” of aeronautics did not yet cover every case and needed to be extended to cover the way that bees fly, which is through lift generated by turbulent airflow. It is very important to realise that what are described as scientific “laws” are just the best working theories at the present time and it is virtually certain that those “laws” will have to be upgraded and extended as further scientific observations are made and further facts discovered. Let’s hope those four elephants don’t get restless before we have a chance to learn a bit more! It should be stressed at this point, that this material is intended to provide you with information and only that. If you should decide, on the basis of what you read here, to build some device or other, you do so solely and entirely at your own risk and on your own responsibility. For example, if you build something in a heavy box and then drop it on your toe, then that is completely your own responsibility (you should learn to be more careful) and nobody other than yourself is in any way liable for your injury, or any loss of income caused while your toe is recovering. Let me amplify that by stating that I do not warrant that any device or system described in this document works as described, or in any other way, nor do I claim that any of the following information is useful in any way or that any device described is useful in any way or for any purpose whatsoever. Also, let me stress that I am not encouraging you to actually construct any device described here, and the fact that very detailed construction details are provided, must not be interpreted as my encouraging you to physically construct any device described in this document. You are welcome to consider this a work of fiction if you choose to do so. I apologise if this presentation seems very elementary, but the intention is to make each description as simple as possible so that everybody can understand it, including people whose native language is not English. If you are not familiar with the basic principles of electronics, then please read the simple step-by-step electronics tutorial in Chapter 12 which is intended to help complete beginners in the subject. At this point in time - the early years of the twenty-first century - we have reached the point where we need to realise that some of the “laws” of science do not cover every case, and while they have been very useful in the past, they do need to be extended to cover some cases which have been left out until now. For example, suppose a bank robber broke into a bank and stole all of the cash there. How much could he take? Answer: “every coin and every note”. The limit is the sum total of all cash in the building. This is what the “Law” of Conservation of Energy is all about. What it says is very simple – you can’t take out any more than there is there in the beginning. That seems pretty straightforward, doesn’t it? As another example, consider a glass tumbler filled completely with water. Using common sense, tell me, how much water can be poured out of the glass? For the purposes of this illustration, please take it that temperature, pressure, gravity, etc. all remain constant for the duration of the experiment. The answer is: “the exact volume contained inside the tumbler”. Agreed. This is what present day science says. To be strictly accurate, you will never be able to pour all of the water out as a small amount will remain, wetting the inside of the glass. Another way of putting this is to say that the “efficiency” of the pouring operation is not 100%. This is typical of life in general, where very few, if any, actions are 100% efficient. So, are we agreed with current scientific thinking then – the maximum amount of water which can pour out of the tumbler is the total volume inside the tumbler? This seems simple and straightforward, doesn’t it? Science thinks so, and insists that this is the end of the story, and nothing else is possible. This arrangement is called a “closed system” as the only things being considered are the glass, the water and gravity. Well, unfortunately for current scientific thinking, this is not the only possible situation and “closed systems” are almost unknown in the real world. Mostly, assumptions are made that the effects of anything else around will cancel out and add up to a net zero effect. This is a very convenient theory, but unfortunately it has no basis in reality. So, now, how much water can be poured out of the tumbler? Answer: “millions of times the volume of the tumbler”. But hang on a moment, haven’t we just said that the absolute limit of water poured from the tumbler has to be the volume inside the tumbler? Yes, that’s exactly what we said, and that is what current science teaching says. The bottom line here is that what current science says does in fact hold true for most of the time, but there are cases where the basic assumption of it being a “closed system” is just not true. One popular misconception is that you can’t get more energy out of a system than you put into it. That is wrong, because the sentence was worded carefully. Let me say it again and this time, emphasise the key words: “you can’t get more energy out of a system than you put into it”. If that were true, then it would be impossible to sail a yacht all the way around the world without burning any fuel, and that has been done many times and none of the driving energy came from the crews. If it were true, then a grain mill driven by a waterwheel would not be able to produce flour as the miller certainly does not push the millstones around himself. If that were true, then nobody would build windmills, or construct solar panels, or tidal power stations. What the statement should say is “more energy can’t be taken out of a system than is put into it” and that is a very different statement. When sailing a yacht, the wind provides the driving force which makes the trip possible. Notice that, it is the environment providing the power and not the sailors. The wind arrived without them having to do anything about it, and a lot less than 100% of the wind energy reaching the yacht actually becomes forward thrust, contributing to the voyage. A good deal of the energy arriving at the yacht ends up stretching the rigging, creating a wake, producing noise, pushing the helmsman, etc. etc. This idea of no more energy coming out of a system than goes into it, is called “The Law of Conservation of Energy” and it is perfectly right, in spite of the fact that it gets people confused. “Free-Energy Devices” or “Zero-Point Energy Devices” are the names applied to systems which appear to produce a higher output power than their input power. There is a strong tendency for people to state that such a system is not possible since it contravenes the Law of Conservation of Energy. It doesn’t. If it did, and any such system was shown to work, then the “Law” would have to be modified to include the newly observed fact. No such change is necessary, it merely depends on your point of view. Looking at this in isolation, we appear to have a free-energy system which contradicts the Law of Conservation of Energy. It doesn’t, of course, but if you do not view the whole picture, you see a device which has only passive components and yet which (when the coil is of the correct size) causes the headphones to generate vibrations which reproduce recognisable speech and music. This looks like a system which has no energy input and yet which produces an energy output. Considered in isolation, this would be a serious problem for the Law of Conservation of Energy, but when examined from a common sense point of view, it is no problem at all. Power is supplied to a nearby transmitter which generates radio waves which in turn, induce a small voltage in the aerial of the crystal set, which in turn, powers the headphones. The power in the headphones is far, far less than the power taken to drive the transmitter. There is most definitely, no conflict with the Law of Conservation of Energy. However, there is a quantity called the “Coefficient Of Performance” or “COP” for short. This is defined as the amount of power coming out of a system, divided by the amount of power that the operator has to put into that system to make it work. In the example above, while the efficiency of the crystal set radio is well below 100%, the COP is greater than 1. This is because the owner of the crystal radio set does not have to supply any power at all to make it work, and yet it outputs power in the form of sound. As the input power from the user, needed to make it work is zero, and the COP value is calculated by dividing the output power by this zero input power, the COP is actually infinity. Efficiency and COP are two different things. Efficiency can never exceed 100% and almost never gets anywhere near 100% due to the losses suffered by any practical system. The energy which powers the solar panel comes from the sun.. Only some 17% of the energy reaching the solar panel is converted to electrical current. This is most definitely not a contravention of the Law of Conservation of Energy. This needs to be explained in greater detail. The Law of Conservation of Energy applies to closed systems, and only to closed systems. If there is energy coming in from the environment, then the Law of Conservation of Energy just does not apply, unless you take into account the energy entering the system from outside. People sometimes speak of “over-unity” when talking about the efficiency of a system. From the point of efficiency, there is no such thing as “over-unity” as that would mean that more power was coming out of the system than the amount of power entering the system. Our trusty bank robber mentioned above would have to take out of the bank vault, more money than was actually in it, and that is a physical impossibility. There are always some losses in all practical systems, so the efficiency is always less than 100% of the power entering the system. In other words, the efficiency of any practical system is always under unity. However, it is perfectly possible to have a system which has a greater power output than the power input which we have to put into it to make it work. Take the solar panel mentioned above. It has a terribly low efficiency of about 17%, but, we don’t have to supply it with any power to make it work. Consequently, when it is in sunlight, it’s Coefficient Of Performance (“COP”) is it’s output power (say, 50 watts) divided by the input power needed to make it work (zero watts) which is infinity. So, our humble, well-known solar panel has terrible efficiency of 17% but at the same time it has a COP of infinity. It is now generally accepted that “Dark Matter” and “Dark Energy” form more than 80% of our universe. There is nothing sinister about the adjective “Dark” as in this context, it merely means that we cannot see it. There are many useful things which we utilise, which we can’t see, for example, radio waves, TV signals, magnetism, gravity, x-rays, etc. etc. The fact of the matter is, that we are sitting in a vast field of energy which we can’t see. This is the equivalent of the situation for the crystal set shown above, except that the energy field we are in is very, very much more powerful than the radio waves from a radio transmitter. The problem is, how to tap the energy which is freely available all around us, and get it to do useful work for us. It can definitely be done, but it is not easy to do. Some people think that we will never be able to access this energy. Not very long ago, it was widely believed that nobody could ride a bicycle faster than 15 miles per hour because the wind pressure on the face of the rider would suffocate him. Today, many people cycle much faster than this without suffocating - why? - because the original negative opinion was wrong. Not very long ago, it was thought that metal aircraft would never be able to fly because metal is so much heavier than air. Today, aircraft weighing hundreds of tons fly on a daily basis. Why? - because the original negative opinion was not correct. It is probably worth while, at this point, to explain the basics of Zero-Point Energy. The experts in Quantum Mechanics refer to how the universe operates as “Quantum Foam”. Every cubic centimetre of “empty” space is seething with energy, so much in fact, that if it were converted using Einstein’s famous equation E = mC2 (that is Energy = Mass x a very big number), then it would produce as much matter as can be seen by the most powerful telescope. There is actually nothing “empty” about space. So why can’t we see anything there? Well, you can’t actually see energy. All right then, why can’t you measure the energy there? Well, two reasons actually, firstly, we have never managed to design an instrument which can measure this energy, and secondly, the energy is changing direction incredibly rapidly, billions and billions and billions of times each second. There is so much energy there, that particles of matter just pop into existence and then pop back out again. Half of these particles have a positive charge and half of them have a negative charge, and as they are evenly spread out in three-dimensional space, the overall average voltage is zero. So, if the voltage is zero, what use is that as a source of energy? The answer to that is “none” if you leave it in it’s natural state. However, it is possible to change the random nature of this energy and convert it into a source of unlimited, everlasting power which can be used for all of the things we use mains electricity for today - powering motors, lights, heaters, fans, pumps, ... you name it, the power is there for the taking. So, how do you alter the natural state of the energy in our environment? Actually, quite easily. All that is needed is a positive charge and a negative charge, reasonably near each other. A battery will do the trick, as will a generator, as will an aerial and earth, as will an electrostatic device like a Wimshurst machine. When you generate a Plus and a Minus, the quantum foam is affected. Now, instead of entirely random plus and minus charged particles appearing everywhere, the Plus which you created gets surrounded by a sphere of minus charge particles popping into existence all around it. Also, the Minus which you created, gets surrounded by a spherical-shaped cloud of plus-charge particles popping into existence all around it. The technical term for this situation is “broken symmetry” which is just a fancy way of saying that the charge distribution of the quantum foam is no longer evenly distributed or “symmetrical”. In passing, the fancy technical name for your Plus and Minus near each other, is a “dipole” which is just a techno-babble way of saying “two poles: a plus and a minus” - isn’t jargon wonderful? So, just to get it straight in your mind, when you make a battery, the chemical action inside the battery creates a Plus terminal and a Minus terminal. Those poles actually distort the universe around your battery, and causes vast streams of energy to radiate out in every direction from each pole of the battery. Why doesn’t the battery run down? Because the energy is flowing from the environment and not from the battery. If you were taught basic physics or electrical theory, you will probably have been told that the battery used to power any circuit, supplies a stream of electrons which flows around the circuit. Sorry Chief - it just ain’t like that at all. What really happens is that the battery forms a “dipole” which nudges the local environment into an unbalanced state which pours out energy in every direction, and some of that energy from the environment flows around the circuit attached to the battery. The energy does not come from the battery. Well then, why does the battery run down, if no energy is being drawn from it to power the circuit? Ah, that is the really silly thing that we do. We create a closed-loop circuit (because that’s what we have always done) where the current flows around the circuit, reaches the other battery terminal and immediately destroys the battery’s “dipole”. Everything stops dead in it’s tracks. The environment becomes symmetrical again, the massive amount of readily available free-energy just disappears and you are back to where you started from. But, do not despair, our trusty battery immediately creates the Plus and Minus terminals again and the process starts all over again. This happens so rapidly that we don’t see the breaks in the operation of the circuit and it is the continual recreation of the dipole which causes the battery to run down and lose it’s power. Let me say it again, the battery does not supply the current that powers the circuit, it never has and it never will - the current flows into the circuit from the surrounding environment. What we really need, is a method of pulling off the power flowing in from the environment, without continually destroying the dipole which pushes the environment into supplying the power. That is the tricky bit, but it has been done. If you can do that, then you tap into an unlimited stream of inexhaustible energy, with no need to provide any input energy to keep the flow of energy going. In passing, if you want to check out the details of all of this, Lee and Yang were awarded the Nobel Prize for Physics in 1957 for this theory which was proved by experiment in that same year. This book includes circuits and devices which manage to tap this energy successfully. Today, many people have managed to tap this energy but no commercial device is readily available for home use, though it is quite likely that there will be in the next six months as some are going through mandatory government testing for safety and reliability ahead of production being approved. This situation has been a long time coming. The reason for this is human rather than technical. More than 3,000 Americans have produced devices or ideas for devices but none have reached commercial production due to opposition from influential people who do not want such devices freely available. One technique is to classify a device as “essential to US National Security”. If that is done, then the developer is prevented from speaking to anyone about the device, even if he has a patent. He cannot produce or sell the device even though he invented it. Consequently, you will find many patents for perfectly workable devices if you were to put in the time and effort to locate them, though most of these patents never see the light of day, having been taken by the people issuing these bogus “National Security” classifications. The purpose of this book is to present the facts about some of these devices and more importantly, where possible, explain the background details of why and how systems of that type function. As has been said before, it is not the aim of this book to convince you of anything, just to present you with some of the facts which are not that easy to find, so that you can make up your own mind on the subject. The science taught in schools, colleges and universities at this time, is well out of date and in serious need of being brought up to date. This has not happened for some time now as people who make massive financial profits have made it their business to prevent any significant advance for many years now. However, the internet and free sharing of information through it, is making things very difficult for them. What is it that they don’t want you to know? Well, how about the fact that you don’t have to burn a fuel to get power? Shocking, isn’t it !! Does it sound a bit mad to you? Well, stick around and start doing some thinking. Suppose you were to cover a boat with lots of solar panels which were used to charge a large bank of batteries inside the boat. And if those batteries were used to operate electric motors turning propellers which drive the boat along. If it is sunny weather, how far could you go? As far as the boat can travel while the sun is up and if the battery bank is large, probably most of the night as well. At sun-up on the next day, you can continue your journey. Oceans have been crossed doing this. How much fuel is burned to power the boat? None !! Absolutely none at all. And yet, it is a fixed idea that you have to burn a fuel to get power. Let me start by presenting some of the facts about electrolysis. The electrolysis of water is performed by passing an electric current through the water, causing it to break up into hydrogen gas and oxygen gas. This process was examined in minute detail by Michael Faraday who determined the most energy efficient possible conditions for electrolysis of water. Faraday determined the amount of electric current needed to break the water apart, and his findings are accepted as a scientific standard for the process. I can see no reason for doubting Faraday’s results. We now bump into a problem which scientists are desperate to ignore or deny, as they have the mistaken idea that it contradicts the Law of Conservation of Energy – which, of course, it doesn’t. The problem is an electrolyser design by Bob Boyce of the USA which appears to have an efficiency twelve times greater than Faraday’s maximum possible gas production. This is a terrible heresy in the scientific arena and it gets the average “by the book” scientist very up-tight and flustered. There is no need for this worry. The Law of Conservation of Energy remains intact and Faraday’s results are not challenged. However, an explanation is called for. Here, current is supplied to the electrolyser by the electrical supply. The current flow causes breakdown of the water contained in the electrolyser, resulting in the amount of gas predicted by Faraday (or less if the electrolyser is not well designed and accurately built). The very important distinction here is that the power flowing into the electrolyser and causing the water to break down and produce the gas output, is coming almost exclusively from the environment and not from the electrical supply. The main function of Bob’s electrical supply is to power the device which draws energy in from the environment. Consequently, if you assume that the current supplied by the electrical supply is the whole of the power driving the electrolyser, then you have a real problem, because, when properly built and finely tuned, Bob’s electrolyser produces up to 1,200% of Faraday’s maximum efficiency production rate. This is an illusion. Yes, the electrical input is exactly as measured. Yes, the gas output is exactly as measured. Yes, the gas output is twelve times the Faraday maximum. But Faraday’s work and the Law of Conservation of Energy are not challenged in any way because the electrical current measured is used primarily to power the interface to the environment and nearly all of the energy used in the electrolysis process flows in from the local environment and is not measured. What we can reasonably deduce is that the energy inflow from the environment is probably about twelve times the amount of power drawn from the electrical supply. At this point in time, we do not have any equipment which can measure this environmental energy. We are in the same position as people were with electrical current five hundred years ago – there was just no equipment around which could be used to make the measurement. That, of course, does not means that electrical current did not exist at that time, just that we had not developed any equipment capable of performing measurement of that current. Today, we know that this environmental energy exists because we can see the effects it causes such as running Bob’s electrolyser, charging batteries, etc. but we can’t measure it directly because it vibrates at right-angles to the direction that electrical current vibrates in. Electrical current is said to vibrate “transversely” while this zero-point energy vibrates “longitudinally”, and so has no effect on instruments which respond transversely such as ammeters, voltmeters, etc. Bob Boyce’s 101-plate electrolyser produces anything up to 100 litres of gas per minute, and that rate of production is able to power internal combustion engines of low capacity. The vehicle alternator is perfectly capable of powering Bob’s system, so the result is a vehicle which appears to run with water as the only fuel. This is not the case, nor is it correct to say that the engine is powered by the gas produced. Yes, it does utilise that gas when running, but the power running the vehicle is coming directly from the environment as an inexhaustible supply. In the same way, a steam engine does not run on water. Yes, it does utilise water in the process, but the power that runs a steam engine comes from burning the coal and not from the water. This beginner's introduction presumes that you have never heard of free-energy before and would like an outline sketch of what it is all about, so let's begin at the beginning. We tend to have the impression that people who lived a long time ago were not as clever as we are - after all, we have television, computers, mobile phones, games consoles, aeroplanes, …. But, and it is a big "but", the reason why they did not have those things is because science had not advanced far enough for those things to become possible. That did not mean that the people who lived before us were any less clever than we are. For example, could you, personally, come up with an accurate calculation of the circumference of the Earth? This has to be without prior knowledge, no satellites, no astronomical information, no calculators, no computers and no experts to guide you. Eratosthenes did by observing the shadows in two wells some 800 kilometres apart. When was that? More than two thousand years ago. You have probably heard of the geometry of Pythagoras who lived hundreds of years before Eratosthenes, and that geometry is still used in remote areas to lay out the foundations for new buildings. You have probably heard of Archimedes who worked out why things float. He lived more than two thousand years ago. So, how do those people stack up against you and me? Were they stupid people? This is quite an important point because it demonstrates that the body of scientific information enables many things which were not thought possible in earlier times. This effect is not restricted to centuries ago. Take the year 1900. My father was a youngster then, so it is not all that long ago. It would be another three years before Orville and Wilbur Wright made their first 'heavier-than-air' flight, so there no aircraft around in 1900. There were no radio stations and most definitely, no television stations, nor would you have found a telephone inside a house. The only serious forms of information were books and periodicals or teaching establishments which relied on the knowledge of the teachers. There were no cars and the fastest form of transport for the average person was on a galloping horse. Today, it is difficult to grasp what things were like not all that long ago, but come closer in time and look back just fifty years. Then, people researching in scientific fields had to design and build their own instruments before they ever got to experimenting in their chosen fields of knowledge. They were instrument makers, glass-blowers, metal workers, etc. as well as being scientific researchers. Nowadays there are measuring instruments of all kinds for sale ready-made. We have silicon semiconductors which they didn't have, integrated circuits, computers, etc. etc. The important point here is the fact that advances in scientific theory have made possible many things which would have been considered quite ridiculous notions in my father's time. However, we need to stop thinking as if we already know everything there is to know and that nothing which we think of as "impossible !!" could ever happen. Let me try to illustrate this by remarking on just a few things which as recently as the year 1900 would have marked you out as a "lunatic crank", things which we take for granted today because, and only because, we are now familiar with the science behind each of these things. Today, we know that these things are not just possible, but we take them for granted. 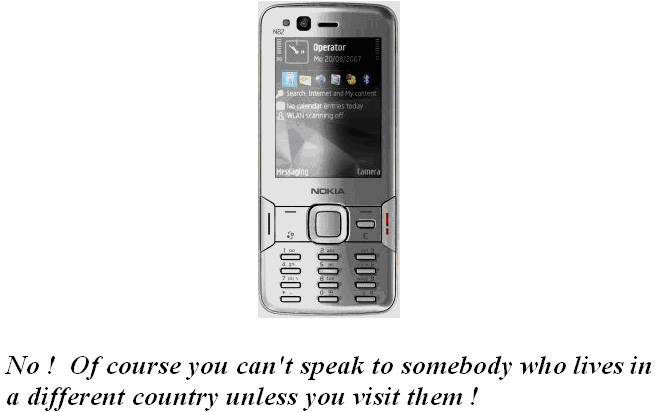 We have a mobile phone in our pocket and could easily use it to talk to friends in other countries almost anywhere in the world. It would seem very strange if we could not do that any more. 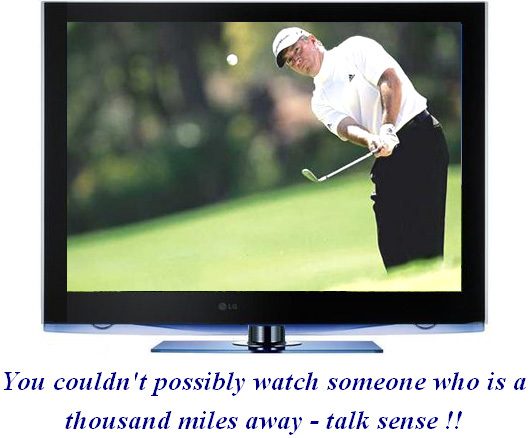 We each have a television and can watch, say, a golf tournament taking place at the other side of the world. We watch in real time, seeing the result of each stroke almost as soon as the golfer does himself. Even suggesting that such a thing was possible might have got you burnt at the stake for witchcraft, not all that long ago, but not having television would seem a very strange situation for us today. If we see a 350 ton metal Boeing 747 aircraft flying past, we would not think it to be strange in any way, let alone think it was "impossible". It is routine, casual travel at 500 mph, a speed which would have been considered to be a fantasy when my father was young. The fact that the aircraft is so heavy, is of no concern to us as we know that it will fly, and does so, routinely, every day of the year. We take for granted, a computer which can do a million things in one second. 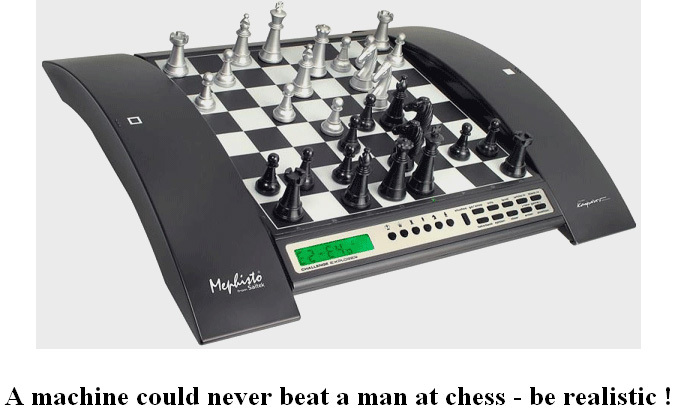 Today, we have lost the understanding of how big "a million" is, and we know that most people are likely to lose a game of chess if they play against a computer, even a cheap chess computer. What we need to understand is that our present scientific knowledge is far from being comprehensive and there is still a very large amount to be learned, and that things which the average person today would consider "impossible" are quite liable to be casually routine day-to-day devices in just a few years time. This is not because we are stupid but instead it is because our current science still has a long way to go. The objective of this website (http://www.free-energy-info.com/) is to explain some of the things which current science is not teaching at the present time. Ideally, we want a device which will power our homes and cars without the need to burn a fuel of any kind. Before you get the idea that this is some new and wild idea, please remember that windmills have been pumping water, milling grain, lifting heavy loads and generating electricity for a very long time now. Water wheels have been doing similar work for a very long time and both of these devices are fuel-less. The energy which powers windmills and water wheels comes to us via our Sun which heats air and water, causing wind and rain, feeding power to our devices. The energy flows in from our local environment, costs us nothing and will keep on coming whether we make use of it or not. Most of the pictures of wind generators and water wheels which you will see, show devices which would take a large amount of money to set up. The title of this eBook is "The Practical Guide to Free-Energy Devices" and the word "practical" is intended to indicate that most of the things spoken about are things which you, personally, have a reasonable chance of constructing for yourself if you decide to do so. However, while in chapter 14 there are instructions for building your own wind-powered electrical generator from scratch, pumping water uphill without using a fuel and utilising wave power at low cost, these things are subject to the weather. So, because of this, the main subject is the next generation of commercial devices, devices which do not need a fuel in order to function and power our homes and vehicles, devices which operate no matter what the weather is doing. Perhaps I should remark at this point, that the commercial introduction of this new wave of hi-tech devices is being actively opposed by people who will lose a very large stream of revenue when it does eventually happen, as it most certainly will. For example, Shell BP which is a typical oil company, makes about US $3,000,000 profit per hour, every hour of every day of every year, and there are dozens of oil companies. The government makes even more than that out of the operation, with 85% of the sale price of oil in the UK being government tax. No matter what they say, (and they both do like to talk "green" in order to gain popularity), neither would ever for a single moment, consider allowing the introduction of fuel-less power devices, and they have the financial muscle to oppose this new technology at every possible level. For example, some years ago MIT in the USA spent millions proving that on board fuel reformers for vehicles would give us all better fuel economy and cleaner air. They did long-term testing on buses and cars to provide proof. They teamed up with the very large auto-parts supplier Arvin Meritor to put these new devices in production vehicles. Then "One Equity Partners" bought out Arvin Meritor's division that did all the final work to get fuel reformers put into all new vehicles. They created a new company, EMCON Technologies, and that company dropped the fuel reformer from their product line, not because it did not work but because it did work. This is not "conspiracy theory" but a matter of public record. Some years ago, Stanley Meyer, a talented man living in the USA, found a very energy-efficient way of breaking water into a mixture of hydrogen gas and oxygen gas. He pushed on further and found that a vehicle engine could be run on quite a small amount of this "hydroxy" gas if it was mixed with air, water droplets and some of the exhaust gas coming from the engine. He got funding to allow him to start manufacturing retro-fit kits which would allow any car to run on water alone and not use any fossil fuel at all. You can imagine how popular that would have been with the oil companies and the government. Just after getting his funding, Stan was eating a meal at a restaurant when he jumped up, said "I've been poisoned ! ", rushed out into the car park and died on the spot. If Stan was mistaken, and he died of 'natural causes', then it was remarkably convenient timing for the oil companies and the government, and his retro-fit kit was never manufactured. Even though Stan left behind many patents on the subject, until recently nobody managed to replicate his very low-power electrolyser, then Dave Lawton in Wales achieved the feat and many people have since replicated it by following Dave's instructions. More difficult still is getting an engine to run on no fossil fuel as Stan did, but recently, three men in the UK achieved just that by getting a standard petrol-engined electrical generator to run with water as the only fuel. Interestingly, this is not something which they want to pursue as they have other areas which are of much more interest to them. Consequently, they have no objections to sharing the practical information on what they did and the details are in chapter 10. Conventional science says that it can prove mathematically that it is quite impossible to do this. However, the calculation is massively flawed in that is not based on what is actually happening and worse still, it makes initial assumptions which are just plain wrong. Even if we were not aware of these calculations, the fact that it has been done is quite enough to show that the current engineering theory is out of date and needs to be upgraded. What makes this arrangement different from a standard set-up is that the battery powered motor is not connected directly to the battery but instead is fed with a rapid series of DC pulses. This has two effects. Firstly, that method of driving a motor is very efficient electrically speaking and secondly, when a flywheel is driven with a series of pulses, it picks up additional energy from the local environment. One other unusual feature is the way that the motor shaft spins a disc with permanent magnets mounted on it. These sweep past a matching set of coils attached to a stationary board, forming an ordinary electrical generator and the resulting electrical power which is generated is converted to DC current and fed back to the driving battery, charging it and maintaining its voltage. Standard theory says that a system like this has to be less than 100% efficient because the DC motor is less than 100% efficient (true) and the battery is well below the 100% efficient mark (true). Therefore, the conclusion is that the system cannot possibly work (false). What is not understood by conventional science is that the pulsed flywheel draws in additional energy from the local environment, showing that conventional science theory is inadequate and out of date and needs to be upgraded. Working quite independently, an Australian called Chas Campbell, discovered the same effect. He found that if he used an AC motor plugged into the mains, that it was possible to get more work done that the amount it takes to drive the motor. The final shaft drives a standard electrical generator and Chas found that he could power electrical equipment from that generator, electrical mains equipment which required greater current that his mains-driven motor did. Chas then took it one stage further and when the system was running at full speed, he switched his mains motor over from the wall socket to his own generator. The system continued to run, powering itself and driving other equipment as well. Once again, conventional science says that this is impossible, which in turn, demonstrates that conventional science is out of date and needs to be expanded to include these observed facts. Permanent Magnets have continuous power. This should be obvious as one will support its own weight on the vertical face of a refrigerator, for years on end. Conventional science says that permanent magnets can't be used as a source of power. However, the reality is that conventional science just doesn't know the techniques necessary for extracting that power. The New Zealander, Robert Adams produced a motor which appears to be, typically, 800% efficient. This, of course, is impossible according to conventional science. Robert was told that if he shared the information, he would be killed. He decided that at his age, being killed was not a major thing, so he went ahead and published all the details. Motors driven by electrical pulses are always less than 100% efficient. The Adams motor looks like that sort of design but it is not. The motor power comes from the permanent magnets mounted on the rotor and not from an electrical pulse applied to the electromagnets attached to the stator. The magnets are attracted to the metal cores of the stationary electromagnets. This provides the driving power of the motor. The electromagnets are then powered just enough to overcome the backwards drag of the magnets when they have just passed by the cores of the electromagnets. 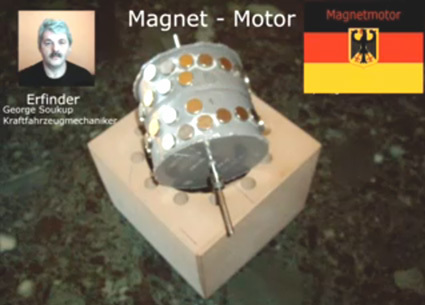 The magnets are attracted to the iron cores of the electromagnets, rotating the drive shaft and powering the motor. The moving magnets generate electrical power in the windings of the electromagnets and this power is used to charge the driving battery. When the permanent magnets reach the electromagnets, a small amount of electrical power is fed to the windings of the electromagnets in order to overcome any backward pull hindering the rotation of the drive shaft. When that power supplied to the electromagnets is cut off, the Back EMF pulse is captured and used to charge the driving battery. When operated in this way, the Adams Motor has a power output far in excess of the input power needed to make it run. The design confuses conventional science because conventional science refuses to accept the concept of energy flow into the motor, from the local environment. This is all the more strange, considering that windmills, water wheels, hydro-electric schemes, solar panels, wave-power systems, tidal power systems and geothermal energy systems are accepted and considered perfectly normal, in spite of the fact that they all operate on energy flowing in from the local environment. It is difficult to avoid the conclusion that vested interests are working hard to prevent conventional science accepting the fact that free-energy is all around us and there for the taking. Perhaps it is the case that they want us to go on paying for fuel to burn to "make" energy to power our homes and vehicles. Conventional science takes a quick glance at this arrangement and proclaims that the motor efficiency has to be less than 100% because of the large electrical pulse needed to make the shaft turn. This just demonstrates a complete lack of understanding of how the motor operates. There is no "large electrical pulse" because the motor is not driven by electrical pulses, but instead it is driven by the attraction of many pairs of magnets, and only a very small electrical pulse is applied to cancel the backward drag as the magnets move past. To put this in context, the powerful prototype motor built by Charles ran at 20,000 rpm and the power for the coils was supplied by an ordinary 9-volt "dry-cell" battery quite incapable of supplying heavy currents. The electrical pulses to the screening coils can be synchronised by the light from Light-Emitting Diodes mounted in the timing section, shining through holes in a timing disc attached to the drive shaft of the motor. The light falling on light-defendant resistors on the other side of the disc, provide the switching for the coil-powering electricity. An alternative method is to skip the timing section altogether and provide the synchronising pulses from an adjustable-frequency electronic pulsing circuit. To start the motor, very slow pulses are generated to get the drive shaft moving, and then the pulse rate is increased to speed the motor up. This has the advantage of providing speed control which can be useful for some applications. Aerial systems. We are surrounded by so much energy that a simple aerial and earth connection can draw in very large amounts of electrical power from the local environment. Moray's device could produce output powers up to fifty kilowatts and it had no moving parts, just a simple aerial and an earth. In spite of the frequent demonstrations, some people would not believe that this was not a hoax, so Moray invited them to choose a place and he would demonstrate the power available at any location they wanted. The earth connection was an eight-foot length of gas pipe which was hammered into the ground. The bank of lights being powered by Moray's device, grew brighter as the gas pipe was driven further and further into the ground, providing a better and better earth connection. Moray then demonstrated that when the aerial was disconnected, the lights went out. When the aerial was connected again, the lights were lit again. He then disconnected the earth wire and the lights went out and stayed out until the earth wire was connected again. The sceptics were completely convinced by the demonstration. Moray's is one of several excellent and very successful devices which I can't tell you exactly how to replicate but the important point here is that a 57-foot aerial raised just 8-feet from the ground can provide kilowatts of electrical power at any location, if you know how to do it. Moray's demonstrations were highly unpopular with some people and he was shot at in his car. He put bullet-proof glass in his car, so they came into his laboratory and shot at him there. They succeeded in intimidating him into stopping his demonstrations or publishing the exact details of how to replicate his aerial power system. Lawrence Rayburn of Canada has recently developed an aerial system with one part raised thirty feet above the ground. He powers his farm with it and has measured more than 10 kilowatts being drawn from it. Hermann Plauston has a patent which reads more like a tutorial on how to extract useful power from an aerial. He describes installations of his which produce 100 kilowatts of excess power as being "small" systems. Tesla Coils. 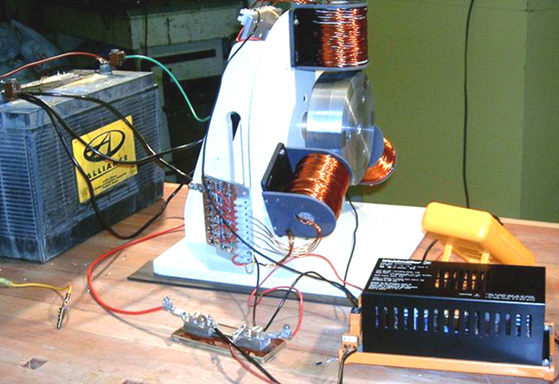 Instead of using an aerial, it is possible to use a Tesla Coil which produces very high currents if the primary winding is placed in the middle of the secondary winding and not at one end which is the usual configuration. Tesla directs the output on to a single metal plate and powers a load between the plate and the earth. Don Smith demonstrates this in a video currently on YouTube. He uses a capacitor made from two metal plates with a sheet of plastic between them, instead of Tesla's insulated single plate. The load is powered between the capacitor and earth. The video shows Don using a 28-watt hand-held Tesla Coil and producing what looks like several kilowatts of power in the earth line. Don points out that the output power is proportional to the square of the voltage and the square of the frequency: So if you double the frequency and double the voltage there will be 16 times the output power. Tariel Kapanadze demonstrates this in a web video of his interview for Turkish TV. 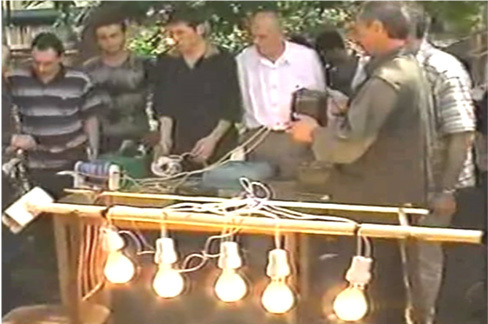 It shows him making an earth connection by burying an old car radiator, and then lighting a row of light bulbs from a Tesla Coil style fuel-less device. While the commentary is not in English, the video is very informative. You will notice that this is a substantial power output coming from a device built with a very basic style of construction where bare wires are twisted together to form an electrical connection. When the starting battery is removed, the equipment is held in the air to show that it is self-contained and self-powered. This is another confirmation that free-energy is all around us and ready to be taken by anyone who knows how. Tariel is seen here lighting a row of five light bulbs hanging from a broom handle placed across the backs of two chairs - not exactly a high-tech, high-cost form of construction this! They found that if his tube was subjected to a few seconds of high-frequency electromagnetic radiation, then it became radioactive for about one hour. During that time, a kilowatt of electrical power could be drawn from this tiny tube. Near the end of the hour, another burst of electromagnetic waves keeps the tube radioactive and maintains the output current. Lead shielding is used to make this a safe device. They have a patent on this device. The expected working life of one of these tubes is estimated as being seventy years. Electrolysis. Michael Faraday did a really excellent job of investigating how much energy was required to change water from it's liquid state into a mixture of hydrogen gas and oxygen gas. Conventional science has latched on to this information and refuses to believe that it is not the last possible word on electrolysis. This is akin to saying that the fastest a man can propel himself over the ground is by running, and refusing to accept the fact that there might be a later invention of a bicycle which would allow a much faster human-powered speed over the ground. In his patent, Shigeta indicates his disappointment that his laboratory tests only showed an efficiency of ten times that of Faraday while his calculations showed that he could be getting twenty times the Faraday result. The different method, along with the use of powerful magnets at the top and bottom of his electrode pairs, bypassed the limits which Faraday had established. Bob Boyce of the USA has produced a pulsed electrolysis system which has given measured outputs which are twelve times that of Faraday's established "maximum" efficiency. This makes a nonsense of calculations based on Faraday's results. Excellent as Faraday's results are, they are no longer the limiting factor in splitting water as technology has progress beyond the methods used by Faraday. 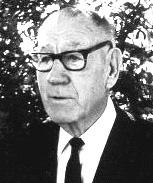 Stanley Meyer of the USA discovered a method of splitting water into it's gas form, using very little power. 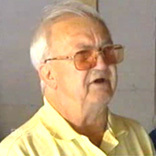 Stan's work has been replicated by Dave Lawton and many other people. For example, Dr Scott Cramton has produced the "hydroxy" gas mix produced by the electrolysis of water, at a rate of 6 litres per minute with a power input of just 36 watts (12 volts at 3 amps). This is dramatically better than Faraday thought was possible and it allows power production through recombining the hydroxy gas to give water again, as the power produced is well above the amount of power needed to split the water in the first place. John Bedini of the USA has patented a system for the rapid charging of batteries with a pulsed waveform. Using banks of batteries tends to be very expensive, very space-consuming and replacement batteries are needed at frequent intervals, giving the user a disposal problem and additional cost. Batteries have the serious restriction that they get damaged and their life shortened if the rate of discharge is less than 20 hours. So a 100 Amp-Hour battery can only manage a 5 amp current (60 watts) if it is not to be damaged. The term "Free-Energy" generally means a method of drawing power from the local environment, without the need to burn a fuel. There are many different successful methods for doing this and these methods span many countries and many years. The amount of power which can be collected can be very high and the few kilowatts needed to power a household is most definitely within the reach of most of the devices mentioned. Not particularly expensive, nor difficult to buy, this device produces an AC waveform of thousands of volts at tens of thousands of cycles per second. Connected in the right way, it draws large amounts of power from the environment as described by Don Smith who is a very talented American man. A specially shaped step-up transformer called a Tesla Coil is used to boost the voltage even higher and that has a dramatic effect because the power drawn into the circuit from outside is proportional to the square of the voltage and the square of the frequency. So, if you double the voltage and double the frequency, the extra power is boosted by a factor of sixteen times. The technique used looks mad if you don't understand what is happening, because you step up the voltage and frequency, and then you step them both down again, which looks like a waste of time, but, and it is a big "but", one simple device described in chapter 3 produces excess power of 160 kilowatts as well as powering itself. The 'bottom line' is that energy can definitely be drawn from the local environment in sufficient quantities to supply all of our needs. For whatever reason, conventional science appears determined not to accept this basic fact and denies it at every opportunity. It seems likely that vested financial interests are the root cause of this refusal to accept the facts. The true scientific method is to upgrade scientific theory in the light of observed fact and new discoveries, but the true scientific method is not being followed at the present time. Therefore, I invite you to examine the facts, read the information in this eBook and the additional information on the website http://www.free-energy-info.com/ and make up your own mind on the subject. One thing which we are told, is that permanent magnets can’t do any work. Oh yes, magnets can support themselves against the pull of gravity when they stick on your refrigerator, but, we are told, they can’t do any work. Really?? What exactly is a permanent magnet? Well, if you take a piece of suitable material like ‘soft’ iron, put it inside a coil of wire and drive a strong electrical current through the coil, then that converts the iron into a permanent magnet. What length of time does the current need to be in the coil to make the magnet? Less than one hundredth of a second. How long can the resulting magnet support its own weight against gravity? Years and years. Does that not strike you as strange? See how long you can support your own body weight against gravity before you get tired. Years and years? No. Months, then? No. Days, even? No. Well if you can’t do it, how come the magnet can? Are you suggesting that a single pulse for a minute fraction of a second can pump enough energy into the piece of iron to power it for years? That doesn’t seem very logical, does it? So, how does the magnet do it? Well, the answer is that the magnet does not actually exert any power at all. In the same way that a solar panel does not put any effort into producing electricity, the power of a magnet flows from the environment and not from the magnet at all. The electrical pulse which creates the magnet, aligns the atoms inside the iron and creates a magnetic “dipole” which has the same effect that the electrical “dipole” of a battery does. It polarises the quantum environment surrounding it and causes great streams of energy flow around itself. One of the attributes of this energy flow is what we call “magnetism” and that allows the magnet to stick to the door of your refrigerator and defy gravity for years on end. Unlike the battery, we do not put it in a position where it immediately destroys its own dipole, so as a result, energy flows around the magnet, pretty much indefinitely. We are told that permanent magnets can’t be used to do useful work. That is not true. This is a picture of a Chinese man, Shenhe Wang, (or in a different Chinese dialect,Wang Shum Ho), who has designed and built an electrical generator of five kilowatt capacity. 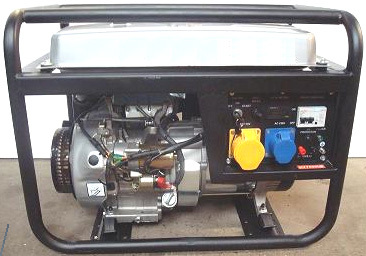 This generator is powered by permanent magnets and so uses no fuel to run. It has been demonstrated publicly, and two of these generators have just successfully completed the Chinese government’s mandatory six-month “reliability and safety” testing programme in April 2008. One large Chinese consortium has started buying up coal-fired electricity generating stations in China in order to refurbish them with pollution-free large versions of Wang’s generator. Several companies are competing for the rights to manufacture home-power versions of less than 10 kW capacity but it appears most likely that this generator will not be allowed to be sold outside of China in spite of Shenhe's desire to give the design away free to all countries. There are ways to reduce this drag on the shaft rotation. One way is to use an Ecklin-Brown style of electrical generator, where the shaft rotation does not move magnets past coils, but instead, moves a magnetic screen which alternatively blocks and restores a magnetic path through the generating coils. A commercially available material called “mu-metal” is particularly good as magnetic shield material and a piece shaped like a plus sign is used in the Ecklin-Brown generator. In the diagram above, the motor at point ‘A’ rotates the shaft and shielding strips at point ‘B”. These rectangular mu-metal strips form a very conductive path for the magnetic lines of force when they are lined up with the ends of the magnets and they effectively shut off the magnet pull in the area of point ‘C’. At point ‘C’, the spring-loaded traveller is pulled to the left when the right-hand magnet is shielded and the left hand magnet is not shielded. When the motor shaft rotates further, the traveller is pulled to the right when the left-hand magnet is shielded and the right hand magnet is not shielded. This oscillation is passed by mechanical linkage to point ‘D’ where it is used to rotate a shaft used to power a generator. Here, the same shielding idea is utilised to produce a reciprocating movement which is then converted to two rotary motions to drive two generators. 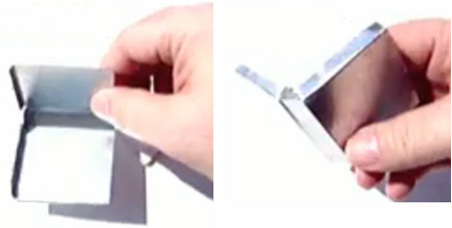 The pair of magnets ‘A’ are placed in a housing and pressed towards each other by two springs. When the springs are fully extended, they are just clear of the magnetic shield ‘B’. When a small electric motor (not shown in the diagram) moves the magnetic shield out of the way, the two magnets are strongly repelled from each other as their North poles are close together. This compresses the springs and through the linkages at ‘C’ they turn two shafts to generate output power. Another effective power take-off system is that used by the “Phi Transformer” (“Phi” is pronounced “Fi”). In this design, the magnetic drag is reduced by containing the magnetic flux in a laminated iron ring or “toroid”. Again, the design expects an electric motor to be used to spin the rotor, but there does not seem to be any great reason why a permanent magnet motor should not be used instead. Toroidal shapes are clearly important in many devices which pull in additional energy from the environment, even to the extent that Bob Boyce warns against the high-frequency sequential pulsing of coils wound on a toroid yoke, producing a rotating magnetic field as unpredictable surge events can generate some 10,000 amps of additional current which will burn out the circuit components and can very well trigger a radiant energy build up which can create a lightning strike. Bob himself has been hit by just such a lightning strike and he is lucky to have survived. Lesser systems such as the toroid transformer used in Bob’s electrolyser system are safe even though they generate a power gain. So the many toroidal system designs are definitely worth examining. which would make the winding of the coils very much easier as standard bobbins could be slotted into place as the core yoke is being assembled. Here, two identical coils are wired in parallel and driven by a pulsed DC voltage. When they are powered up a strong attraction is created between these stationary coils and the permanent magnet fixed to a rotating disc positioned between the coils. This attraction causes the rotor to rotate, moving the magnet into the space between the coils. If nothing were changed, then the magnet would overshoot the centre of the coils and then experience a pull backwards towards the coils. To avoid this, the electrical power is cut as soon as the magnet passes the centre of the coils. This produces a large voltage of the opposite polarity in the coil and that has two beneficial effects. 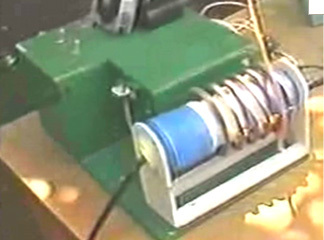 The first effect is that the poles of the coils are reversed and instead of dragging the magnet backwards, the coils actually push the magnet onwards. The second effect is that the voltage pulse can be directed through diodes to pass that “back EMF” power pulse back to charge a battery, regaining some of the electrical power used to drive the rotor. The only physical difference is that the coils are wired in series rather than in parallel, that is, in a daisy chain rather than wired directly across each other. The non-obvious difference is that the Adams motor is driven by the power of the permanent magnets being attracted to the metal cores of the coils and the power applied to prevent the backwards drag when the rotor magnet has passed the centre of the coil. The Raymond Kromrey electrical generator design claims a near-zero magnetic drag factor and it is described in detail in Chapter 2. The point that he makes is that the magnetic flux of his motor is always unbalanced, thus producing a continuous rotational drive. 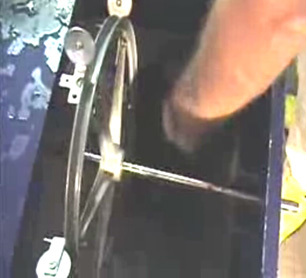 The rotor magnets are joined in stepped pairs, connected by a non-magnetic yoke. The stator magnets are placed on a mu-metal apron cylinder. Mu-metal is very highly conductive to magnetic flux (and is expensive). The patent states that the armature magnet is 3.125” (79.4 mm) long and the stator magnets are 1” (25.4 mm) wide, 0.25” (6 mm) deep and 4” (100 mm) long. It also states that the rotor magnet pairs are not set at 120 degrees apart but are staggered slightly to smooth out the magnetic forces on the rotor. It also states that the air gap between the magnets of the rotor and the stator are a compromise in that the greater the gap, the smoother the running but the lower the power. So, a gap is chosen to give the greatest power at an acceptable level of vibration. Howard considers permanent magnets to be room-temperature superconductors. Presumably, he sees magnetic material as having electron spin directions in random directions so that their nett magnetic field is near zero until the electron spins are aligned by the magnetising process which then creates an overall nett permanent magnetic field, maintained by the superconductive electrical flow. the magazine article can be seen here. This is a patent which is definitely worth reading and considering, especially since it is not a complicated presentation on the part of the authors, Harold Ewing, Russell Chapman and David Porter. This seemingly very effective generator appears to be overlooked at the present time. It seems quite clear that permanent magnet motors are a wholly viable option for the home constructor and they are capable of substantial power outputs over long periods. The motor operation is as simple as possible with just four switches made from springy metal, pushed by a cam on the rotor shaft. Each switch just powers it’s electromagnet when it needs to pull and disconnects it when the pull is completed. The resulting motor is very powerful and very simple. Additional power can be had by just stacking one or more additional layers on top of each other. The above diagram shows two layers stacked on top of one another. Only one set of four switches and one cam is needed no matter how many layers are used, as the solenoids vertically above each other are wired together in parallel as they pull at the same time. The power delivered by the Teal motor is an indication of the potential power of a permanent magnet motor which operates in a rather similar way by moving magnetic shields to get a reciprocating movement. James E. Jines and James W. Jines were awarded US Patent 3,469,130 on 23rd September 1969 “Means for Shielding and Unshielding Permanent Magnets and Magnetic Motors Utilising the Same” and which is in the Appendix. 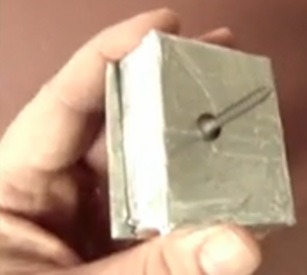 This magnet motor design uses selective shielding of the drive magnets to produce a continuous force in one direction. It also has a mechanical arrangement to progressively adjust the shielding to adjust the power of the motor. This is a very interesting design of magnetic motor, especially since it does not call for any materials which are not readily available from many suppliers. It also has the advantage of not needing any form of exact adjustment or balancing of magnetic forces to make it operate. This design relies on the magnetic field of a magnet being distorted by having the pole faces angled at 45 degrees. In the diagram, the magnets are shown in blue and they are mounted in a non-magnetic stator and rotor material shown in grey. The rotor is mounted on two ball races shown in yellow. The theory is that the repulsing forces of the four North-North outer magnet pairs along with the repulsing forces of the four inner South-South magnet pairs should be continuously greater than the North-South attracting forces, thus giving continuous rotation. To recap: the underlying principle of the power of magnets is that each permanent magnet mentioned here, has two magnetic poles (one “North” and one “South” pole) and these poles being of opposite type and near each other, form a “dipole”. This dipole unbalances the quantum environment around the magnet, causing continuous streams of energy to flow out in every direction from the magnet. These streams of energy are not what we see as lines of magnetic force, and to date, nobody has managed to design any piece of equipment which responds to that energy and which can be used to measure it. At this point in time, all we can do to estimate the energy flow is to divert it into a battery and then assess the battery charge by measuring the length of time that the battery can power a load from the energy which it received. This is a very crude method, but it does work. Here, the yellow arm marked 38, rocks to the right and left, pushed by a solenoid coil 74. There is no obvious reason why this rocking motion could not be achieved by a mechanical linkage connected to the rotating output shaft 10. The three arms 20, 22 and 24, being pivoted at their upper points, are pushed into a central position by the springs 34 and 35. The magnets 50, 51 and 52, are moved by these arms, causing a continuous rotation of the output drive shaft 10. The movement of these magnets avoids the position where the magnets reach a point of equilibrium and lock into a single position. Figures 2 and 3 show the position of the magnets, with the Figure 3 position showing a point in the output shaft rotation which is 180 degrees (half a turn) further on than the position shown in Figure 2. Some other, more powerful magnet arrangements which can be used with this design are shown in the full patent in the Appendix. This construction is relatively simple and yet the operation is powerful. The power is provided by three magnets, shown shaded in blue and yellow. The lower magnet is in the form of a disc with the poles arranged on the large, circular, flat faces. This is the stator magnet which does not move. Positioned above it is a disc made of non-magnetic material (shaded in grey) and which has two magnets embedded in it. This disc is the rotor and is attached to the central vertical shaft. Normally, the rotor would not rotate, but between the two discs there is a ring of seven coils which are used to modify the magnetic fields and produce powerful rotation. The powering up of these coils is very simple and it is arranged by shining a beam of Infra Red light from one of the Light-Emitting Diodes through a slot in an optical-timing disc attached to the rotating shaft. The LEDs and the photo-transistors are aligned with the centres of the seven coils. The position and width of the slot controls which photo-transistor gets switched on and for how long it remains powered up. This is a very neat and compact arrangement. The really interesting part of the design is how the coils modify the magnetic fields to produce the output power of the device. The orientation of the magnet poles can be swapped over, provided that this is done for all three magnets. Shown here is the situation when one of the rotor magnets has rotated to where it is above one of the coils which is not yet powered up. The South pole of the rotor magnet is attracted to the North pole which is the entire upper face of the stator magnet as shown by the three arrows. 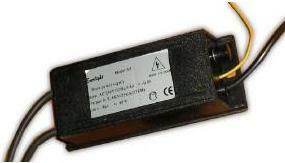 If a voltage is applied to the coil, then this magnetic coupling is disrupted and altered. If any torque is developed as a result of the coil being powered up, then it will be developed to either side of the energised coil. If the coil is not powered up, then there will be full attraction between the magnets and no rotational force will be produced. You will notice that there are two rotating magnets (an even number) and seven coils (an odd number) so when one of the rotor magnets is above a coil, then the other isn’t. This staggering of the two positions is essential for generating smooth, continuous rotational torque and self-starting without any need to rotate the shaft manually. This diagram shows a piece from both sides of the rotor disc, to explain the operation of the coils. On the left, magnet 56 overlaps coil 32 and coil 34. Coil 32 is powered up and this breaks the magnetic link on the left hand side of magnet 56. But, coil 34 is not powered up, so the attraction between magnet 56 and the disc magnet under the coils remains. Even though this attraction is at a downward angle, it creates a push on the rotor, driving it towards the right as shown by the red arrow. While this is happening, the situation around the other side of the rotor disc, is shown on the right. Here, magnet 54 is above coil 36 and that coil is not powered up, so there is no resulting drive in either direction. The adjacent coil 38 is also not powered up and so has no effect on the rotation. This method of operation is very close to that of the motor design of Robert Adams described in the next chapter. It is important to understand that this method of operation is nothing like that of the John Bedini pulsers where the rotation of a disc is caused by the electrical pulse applied to a coil. Instead, here, the coil acts as a magnetic shield, being provided with the minimum possible power to do its job. The coil is, in effect, a shield which has no moving parts, and so is a very clever mechanism for overcoming the tendency for the rotor magnets locking on to the stator magnets and preventing rotation. At any moment, six of the seven coils are inactive, so in effect, just one coil is powered. This is not a major current drain. It is important to understand that the power of this motor is provided by the permanent magnets pulling towards each other. Each of the two magnets applies a horizontal pull on the rotor every seventh of a turn, that is, every 51.1 degrees in the rotation. As the coils are an uneven number, the rotor gets a magnetic pull every 25.5 degrees in the rotation, first from one rotor magnet and then from the other rotor magnet. It should be remembered that the timing section shown above could be replaced by a NE555 timer circuit which generates a steady stream of On / Off pulses. When those pulses are fed to the coils, the motor rotates, slaving itself to the pulse rate. This gives an immediate speed control for the motor as well as avoiding the need for the precise positioning of the slotted disc which allows the LEDs to shine directly on to the phototransistors at the appropriate instant. If that approach is taken, then the timing section shown above would be omitted. Just five components are used. The current through the coil is controlled by a transistor. In this case it is a Field-Effect Transistor usually called a "FET". The most common type of FET is used, namely an "N-channel" FET which is the rough equivalent to an NPN transistor as described in Chapter 12. A FET of this type is switched off when the voltage on it's "gate" (marked "g" in the diagram) is 2.5 volts or lower. It is switched on when the voltage on it's gate is 4.5 volts or more. In this circuit we want the FET to switch on when the motor's timing disc is in the right position and be off at all other times. This is arranged by shining the light from a Light-Emitting Diode or "LED" through a hole in the timing disc which rotates with the shaft of the motor. When the hole is opposite the LED for the coil which is to be powered up, light shines through the hole and on to a light-sensitive device, Charles has opted to use a Light-Sensitive transistor, but a light-dependent resistor such as an ORP12 could be used instead. When the light shines on the "Opto1" device in the circuit diagram, it's resistance falls dramatically, raising the voltage on the gate of the FET and switching it on. When the timing disc hole moves past the LED, the light is cut off and the FET gate voltage drops down, switching the FET off. This arrangement causes the coil of the motor to be switched on and off at just the right time to give a powerful rotation of the motor shaft. In the circuit, the resistor "R1" is there to make sure that the current flowing through the LED is not excessive. The resistor "R2" has a low value compared to the resistance of "Opto1" when no light falls on it, and this holds the gate voltage of the FET down to a low value, making sure that the FET is completely off. Connecting several coils "in series" (in a chain) like this, reduces the number of electronic components needed and it makes sure that the pulses to each of these coils is at exactly the same instant. Alternatively, it is possible to wire these coils across each other "in parallel", the choice is generally dictated by the resistance of the coils. The patent drawing shown above seems to indicate that there is a big gap between the LEDs and the optical devices. This is probably not the case as most people would choose to keep the gap between the LED and the light-dependent device as small as possible, mounting them so that they are just clear of the timing disc on each side of it. In this patent, Charles Flynn remarks that this magnet motor can be used for almost any purpose where a motor or engine drive is required and where the amount of energy available or required to produce the driving force may vary little to nil. Charles has produced motors of this type which are capable of rotating at very high speed - 20,000 rpm and with substantial torque. Lesser speeds can also be produced, and the motor can be made to be self-starting. 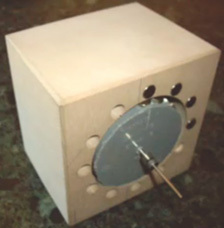 Because of the low power required to operate the device, Charles has been able to operate the motor using just a nine volt, off-the-shelf dry battery. 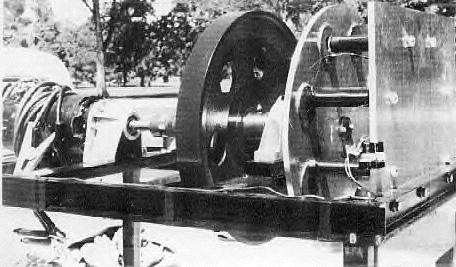 One application which seems most appropriate for this motor design is the Frenette heater shown in Chapter 14. Using this motor to drive the discs inside the heater drum would produce a heater which appears to be driven by just a nine-volt battery. However, while that is the appearance, the reality is that the power of this motor comes from the permanent magnets and not from the battery. The battery current is only used to prevent the backward pull of the magnets and it is not used to drive the motor. While the use of a timing disc is a very satisfactory arrangement, it is also possible to use electronic circuitry instead of the mechanical timing disc, the opto devices and the LEDs. What is needed here is a device which produces a series of voltage pulses which can be used to drive the gate voltage of each FET from below 2.5 volts to over 4.5 volts. It looks as if the well-known 555 timer chip would be suited to this task and it would certainly run off the nine-volt battery. However, we have more than one set of coils which need to be run. For example, if we have say, four sets of coils to drive by powering up four different FET transistors one after the other, then we could use a "Divide-by-Eight" chip, like the 4022 chip. This chip can be set to divide by any number from two to eight. All that is needed to select the number to divide by, is one connection between two of the pins on the chip. The output voltage on the pins marked "1", "2", "3" and "4" goes high one after the other as shown in the diagram above. So, each of these output pins would be connected to the FET gates in that order and the FETs would get switched on in that same order. When using a circuit like this, the pulse rate from the 555 chip is set to a very low value like half a second, so that the motor shaft can get started. Once it gets moving, the pulse rate is gradually increased to speed the motor up. One advantage of this method is that it allows speed control, and if the motor was being used to power a Frenette heater, then the speed control would also act as a temperature control for the heater. As this allows the speed to be controlled and when the required speed is reached, the pulse width can then be adjusted to give the minimum current draw to maintain that speed. There are, of course, many other suitable circuits which could be used instead of this one and Chapter 12 will fill you in on some of them as well as explaining how circuits work and how to build them. And while this arrangement is not as magnetically efficient as a circular magnet, it does have the convenience of allowing the construction of a rotor of any chosen size. Ideally, unlike the stator shown above, there should be an odd number of magnets, or failing that, an odd number of coils. Alternatively, the rotor could have an odd number of magnets so as to allow self-starting. The objective of each coil is to just, and only just, cancel out the magnetic field of the permanent magnet underneath it. The magnetic field produced by the coil depends on the current flowing in the coil, the number of turns in the coil and the area of the coil. The current flowing depends on the diameter of the wire and the voltage applied to it. It is probably necessary to mount just one magnet on the stator and experiment with the coil until your current drive and coil allow the rotor to spin freely. Whatever the coil result is, should be ok for all of the magnets even though they are likely to vary in strength a bit. Steorn. The Irish company Steorn have produced a system which is almost identical to the Charles Flynn magnet motor just described. They call their device "Orbo" and its operation is pretty much the same. The advance made by Steorn is that they have devised a very clever magnetic masking system using ferrite toroids wound with a copper wire coil. This is a slick method of switching magnetic attraction on and off. When the coil carries a sufficient current it generates a circular magnetic field spiralling around the toroid and not going outside the toroid. This field does not have an attraction for outside magnets. It makes no difference if the direction of the current flow through the coil is reversed as the resulting magnetic field just spins around the toroid in the opposite direction and performs exactly the same magnetic blocking of the ferrite ring which forms the toroid. If no current flows, then the copper wire does not block off the influence of the ferrite ring and the permanent magnets on the rotor are strongly attracted to it, causing the rotor to spin. In this implementation, eight ferrite rings are mounted on the stator in four locations ninety degrees apart. These are wound with copper wire coils which can be powered by a battery, via a timing mechanism. The rotor has embedded in it, eight pairs of small permanent magnets, also spaced ninety degrees apart. In exactly the same way as the Adams motor described in chapter 2, the current through the coils is set to the minimum level which allows the rotor to spin freely. The timing mechanism is then switched in and the motor and the rotor given a spin. The rotor magnets are strongly attracted to their corresponding ferrite rings mounted on the stator posts and this accelerates the rotor. If no current is passed through the coils, then the rotor will oscillate backwards and forwards for a short time before coming to rest with the magnets as close to the ferrite rings as possible. To prevent this happening, the timing circuit senses when the magnets reach the ferrite rings, and passes that minimum current through the coils, trapping the rings inside a magnetic field which has no effect on the rotor magnets. The momentum of the rotor causes it to spin on past the stator rings to a position where the magnets are closer to the next rings than they are to the ones which they have just passed, at which point, the current is cut off and the magnetic attraction to the ferrite rings returns. This is identical to one mode of operation of the Adams motor. The next step is also identical to that of the Adams motor, namely, to add on some pick-up coils to convert some of the rotating magnetic energy into electrical energy, either to recharge the driving battery or to power other equipment, or both. You will notice that each ring of magnets is positioned further around the rim of the cylinder providing powerful pulses from 64 magnets every 22.5 degrees of rotation, so it is little wonder that the motor has considerable shaft power. 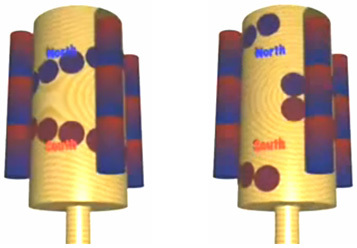 This style of magnet arrangement (North magnets shown in blue and South in red) has a locking point where the switch from wide spacing to narrow spacing occurs and this causes the rotation to stop there. The taper is much less pronounced with an inner gap some four times greater than the gap to the outer ring. It also appears that the last inner magnet has a greater gap around the drum than the remaining ring of magnets. This looks like a design which might be worth investigating further as the implementation shown in the video appears to operate very well. Here, the opposing corners of the magnets are lower down and so there should be a net magnetic force thrust path. I have not tested this myself, but the supposition seems reasonable. If it tests out to be correct, then placing the angled magnets in a ring rather than a straight line, should create a motor stator which has a continuous one-way net field in a circular path. Placing a similar ring of angled magnets around the circumference of a rotor disc, should therefore give a strong rotary movement of the rotor shaft - in other words, a very simple permanent magnet motor. Permanent magnet motors have a Coefficient Of Performance (“COP”) of infinity as they produce output power and the user does not have to provide any input power to make them operate. Remember, COP is defined as Output Power divided by the Input Power which has to be provided by the user to make the device operate. In the following chapter, we will be considering pulsed systems, where the user has to provide input pulses to make the device operate. This prevents these devices from having a COP of infinity and instead, we are looking for any device which has a COP greater than one. However, any device with COP>1 has the potential of becoming self-powered, and if that can be arranged, then the COP does in fact become infinity by definition, as the user no longer needs to supply any input power. The examples of permanent magnet motors and motor-generators mentioned above, have generally been of the type where there is a stationary “stator” and a rotating “rotor”. It should be realised that the arrangement of magnets on the “stator” do not necessarily have to be stationary. Some motor designs do not have a stator, but instead have two or more rotors. This allows the magnets which would have been on the stator to be in position to provide thrust to the output rotor, and then move out of the way so as not to retard the rotor movement. The Bowman magnet motor is one of this type, though admittedly, it uses one stator magnet to get it started and it has two subsidiary small rotors which carry the magnets which would normally be on a stator. A search on the web will provide the details of many permanent magnet motor designs. This gives transport of the rolling ferrous cylinder without any input power being required. There is no limit to the length of the magnetic strip along which the metal cylinder rolls but the cylinder weight of 325 grams is eesential for the inertial effect in keeping the cylinder rolling. With just a ferrous roller, the effect is not powerful. The magnets used by Steele for the track are standard ferrite magnets 75 mm long. This length does not show in the side-view diagram above as it runs away into the distance as does the length of the metal cylinder. The cylinder needs to overlap at least three magnets and the rolling effect causes the cylinder to appear to have only one magnetic pole The magnets have a North pole on one face and a South pole on the opposing face and when they are stacked as shown, they are pulled together by the magnetic effect. Serious experimenters can contact Steele by e-mail for sharing of results or discussing observed effects. The examples of permanent magnet motors and motor-generators mentioned above, have generally been of the type where there is a stationary “stator” and a rotating “rotor”. It should be understood that the arrangement of magnets on the “stator” do not necessarily have to be stationary. Some motor designs do not have a stator, but instead have two or more rotors. This allows the magnets which would have been on the stator to be in position to provide thrust to the output rotor, and then move out of the way so as not to retard the rotor movement. The Bowman magnet motor is one of this type, though admittedly, it uses one stator magnet to get it started and it has two subsidiary small rotors which carry the magnets which would normally be on a stator. A search on the web will provide the details of many permanent magnet motor designs. The motor is arranged so that the twelve magnetic rollers are bolted to a metal disc welded to the rotor shaft. The rollers run around the magnetic path driving the output shaft. The bolts holding the rollers in place are made to be a loose fit on a sleeve made of a material of a type which has a low rotational friction. At the start, the rollers roll in direct contact with the outer stainless steel sleeve, but as the rotation speed increases, the resulting outward pressure causes the rollers to press outwards on their bearings, creating the 1 mm gap shown in the diagram. In the version shown in the photograph above, the bolts holding the rollers in place are secured by nuts but a preferred arrangement is where the holes in the rotor disc are tapped to take the roller bolts directly. 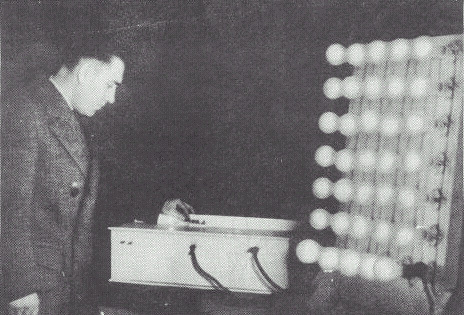 Emil Hartman and Howard Johnson. Both Emil Hartman and Howard Johnson have been granted US Patents on arrangements of permanent magnets which produce a directional push along a straight path. Emil, in July 1980 (Patent 4,215,330) and Howard in October 1989 (Patent 4,877,983) and in March 1995 (Patent 5,402,021). Each of these patents show very different methods of producing the magnetic push and each method has been proven by prototypes constructed by the inventors. Here, the metal ball rolls along a path between two guiding strips shown in blue in the diagram above. The magnets which provide the pulling force on the ball are not seen in the top view as their clamping mechanism (marked 5 in Fig.1 and 6 in Fig.2) hides them from view. They can be seen on the right in Fig.2 where they are marked with the number 8. Interestingly, this device is put forward as an automated conveyor or as a toy, but as the metal ball is raised into the air as well as being moved along the track, the device immediately lends itself to the feed for a gravity wheel constructed in the style of an overshot water-wheel. Also, horror or horrors, this looks like one of the hated "perpetual motion" devices which people who are steeped in conventional physics are too frightened to accept. Notice that the magnets are staggered with those on the right being opposite the gaps between those on the left. Emil opted to use circular bar-shaped magnets with the poles on the circular end faces. The clamping arrangement allows for very precise adjustment of the magnet positions and this will be used when finding the optimum performance. If you wish to examine the full patent, then it can be downloaded free from this website. In the centre of the gap between these two sets of magnets, there is a track for a miniature rail vehicle to run along and that vehicle has curved "Alnico 8" magnets mounted on it, the spacing between those magnets being the same as the spacing of the main magnets and their pole directions match those of the short "gap" magnets. The gap between the tips of the curved magnets and the magnetic walls is 0.5" to 1.25" (12 mm to 32 mm) and the prototype vehicles were boosted down the track covering 2 feet (600 mm) in one second. In the diagram above, all of the North magnetic poles are colour coded red and the South magnetic poles green and these colours are relied on where there is not enough room to mark the magnets clearly with the "N" or "S" letters. Howard remarks that having sets of permanent magnets positioned so closely together, actually strengthens the magnetic effect and so is helpful. The smaller magnets placed between the main magnets do not exceed half of the length of those main magnets and so there is an indentation gap between the main magnets and that gap extends at least half way down the length of the main magnets as shown above. All of the inventors who produce a working linear track device such as these, have great difficulty in modifying the design to produce a continuous circular movement. It is not at all clear why the Howard Johnson design shown above should not have the magnetic walls curved into a large circle and the curved magnets mounted on a non-magnetic gantry arm or disc instead of a vehicle. However, as this has not been done, there is presumably some very good reason why a conversion to circular motion does not work. The outer shielding is “flashing material” which is commonly sold in hardware stores in the US.I have no idea of it’s exact composition. This simple demonstration, which I first posted on 21st January 2008, shows just how effective one-way shielding is in producing a net gain. Here, you see two specially shielded magnets being moved close together. When the two shielded faces are pushed together there is no magnetic effect but when they are reversed and the opposing two faces are pushed towards each other there is a sizeable magnetic push which moves the stationary magnet away. It is this thrust which is the making a fuel-less permanent magnet motor using any one of a number of different possible designs. My long-awaited video showing the method of magnetic shielding which I use. However, shielding is just the half of it and the other half is the exact position of the stator and the angle of approach of the incoming magnets. At all times, only like poles are used as the primary pole, which means that the magnets approaching the stator will be two like poles which must be able to pass close by each other. This approach is what I call “the back door” to my stator, where one of the like poles has been heavily shielded. However, if you provide too much shielding on the stator magnet, then the rotor magnet will be attracted to the heavy metal of that shielding and that would cause a braking effect, opposing the rotation of the rotor. To neutralise this effect we can allow some of the “like pole” to pass through the shielding. When the right amount of magnetism passes through the shielding it exactly balances the attraction of the rotor magnet to the metallic shielding of the stator magnet, allowing unhindered movement of the rotor as it passes the stator magnet. As soon as the rotor magnet has passed “the back door” of the stator magnet, and moved into the unshielded area, the like poles of the stator magnet and the rotor magnet repel each other, giving the rotor a strong push in it’s direction of rotation. This, of course, is immediately repeated by the next rotor magnet, providing the rotational drive for the motor. The turning force is enormous, even on this small scale, and if scaled up, would have enough power to drive a car or power a home. When you take this two-dimensional layout and turn it into a three-dimensional layout (by placing several rotors on the same shaft) you get a tremendous amount of thrust, capable of handling heavy loads and still keep working with the greatest of ease. Best of all, there is only one moving part and it is 99% friction free. 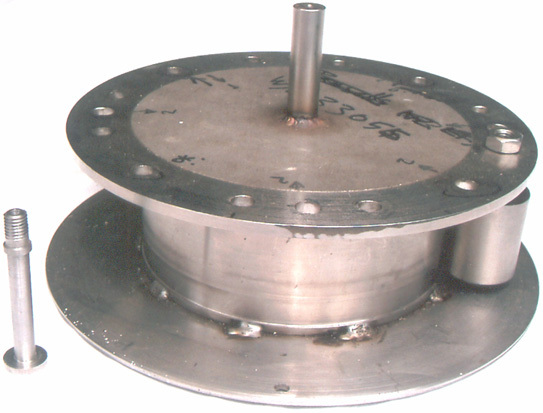 Having the stator long and thin, unlike typical bucket magnets which do not work in this case, this allows for a long 3-inch (75 mm) pass over the stator before the rotor magnet receives its strong push from the stator magnet, spinning the rotor and driving the next rotor magnet across the shielded part of the stator magnet, allowing the process to repeat indefinitely, producing a fuel-less permanent magnet motor. In this picture, a steel screw is shown held on one face by the residual magnetic field but that screw falls off the back face as there is not enough magnetism there to hold it in place. The resulting shape is not unlike a book. There are two of these metal casings, one inside the other. Each of these casings contains an alkaline battery inside it. James stresses that these batteries need to be fully discharged in case a short-circuit develops inside the casing. 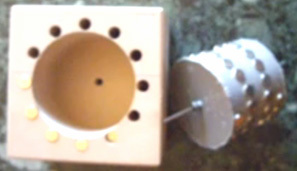 The inner casing contains the magnet and the 1/4” (6 mm) plastic spacer supplied with the magnet, making an overall thickness of 1/2” (12 mm), placed up against the alkaline battery which has a 14 mm diameter, which means that the lower face of the inner casing is not quite parallel with the upper face. 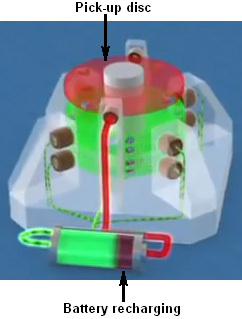 In the diagram, the metal casing is shown in red. This view is looking vertically downwards on a horizontally mounted bicycle wheel which has six magnets attached to the rim. The first two magnets are Grade 52 neodymium 1” x 1” x 1/4” (25 mm x 25 mm x 6 mm) with plastic spacers glued to them. The following four magnets are the same but have a 1” diameter 1/4“ thick circular neodymium magnet placed on top of them. This magnetic attraction setup is demonstrated to accelerate the wheel from a stationary position. 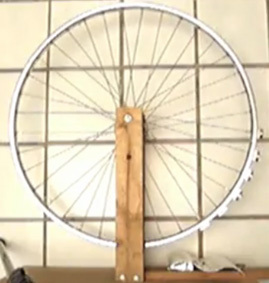 However, in my opinion, this video is not very satisfactory in that it is conceivable that the view is not vertical but horizontal and the rotation taking place due to the weight imbalance of the wheel, as the wheel is restrained immediately after it has stopped instead of allowing time to show that no reverse motion occurs. Also, no information is given as to why the six magnets are not identical, nor why the whole of the rim did not have magnets attached to it, demonstrating continuous rotation. It might be remarked that a wheel of this type is probably a little light for a magnetic rotor as there is considerable advantage in having sufficient rotor weight to generate the momentum needed to carry the rotor past any magnetic sticking point. I can also be remarked that the wheel really needs to be balanced by having an equivalent set of six magnets on the opposite side of the wheel rim, and that placing additional shielded stator magnets at an odd number of positions around the wheel would give a steady powering of the rotor even with only two sets of six rim magnets on the rotor. Considering the very simple construction techniques needed to build a shielded stator magnet, this design looks like an excellent project for a home builder to make and test with different configurations of rotor and shielded stator magnets. The Twin Rotor Suggestion. When you are considering shielding magnets using iron or steel, you need to remember that fridge magnets stick to refrigerators because the refrigerators are made of steel. This demonstrates the fact that there is an attraction between magnets and iron or steel. Consequently, if a magnet is shielded with steel so that it blocks the whole of the magnetic field of the magnet, a second magnet will be attracted to that metal shielding material. 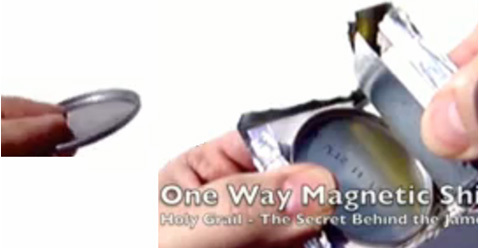 At this website there is, at the present time, a video by “magneticveil” where he proposes the use of this feature of simple shielding in the construction of a magnet motor. At the end of the shield, its width is reduced and tapered so that the magnetic field from the magnet behind it exactly matches the attraction of the magnet on the near side of the shield. This has the effect of giving a completely neutral zone at the tip of the shield, with neither an attraction or a repulsion in that region. The degree of tapering depends on the strength of the magnets, the thickness and material of the shield and the spacing between the magnets and the shield, and it needs to be discovered by experiment. The pull between the magnets “A” and the shield, adds to the rotation caused by the push between the unshielded magnets. This arrangement of magnets and shield should allow continuous rotation of both rotors and the motor can be stopped by removing the shield. It should be noted that this arrangement uses magnets in repulsion mode. That is, the outward-facing poles of the magnets on both rotors are the same. There have been reports of permanent magnet motors where the magnets were in repulsion mode, and while these motors ran well, it was found that after about three months, the magnets lost their magnetisation. If at all possible, magnets should be used in their attraction mode. This is not possible in the above twin-rotor arrangement, so if one is being constructed, it might be a good idea to arrange the physical construction in such a way that the rotor magnets can easily be removed. This allows remagnetisation of the magnets, or alternatively, their replacement if very cheap types are used. This permanent magnet disc drive consists of two basic magnetic components, one large driven flat disc containing a uniform series of identical magnet segments, and a second magnetic driving means comprising multiple oscillating magnetic pairs of opposite identical magnet segments. The magnetic mechanism simulates the action of a clock escapement mechanism in that the oscillating magnet pairs uniformly oscillate between the disc magnet segments to induce continuous disc rotation. All of the multiple oscillating magnet pairs are oscillated by a motor, or motors, which provide an eccentric movement through a suitable gear reduction unit. The small DC motors are powered by multiple arrays of silicon solar photovoltaic cells at some convenient rooftop location. At the present time the magnetic disc drive has reached the stage of development where the oscillating magnet pairs will rotate the magnetic segmented disc when the oscillations is done manually. The disc rotation is smooth and continuous when the manual oscillation is uniform and continuous, and the disc speed may be increased as the oscillation rate is increased. Since the adequate functioning of the magnetic/mechanical-conversion concept has now been proven with a working prototype, a practical and economical self and/or external oscillation means for the oscillating magnetic pairs must now be developed. The magnetic disc drive was originally designed to be self-actuated by means of a multi-lobe cam and push rod arrangement, but this approach has not been proven successful to date. A disadvantage for the self-actuated type of magnetic disc drive is that the disc is locked-in with a low, fixed speed output which is dependant on the natural magnetic field interaction between the involved interacting magnet segments. A mid-diameter direct displacement multi-lobe cam was used for the first prototype, but this did not work because of the high rotational resistance imposed by the high cam lobe angles. A peripheral, direct displacement multi-lobe cam was also tried but this was not successful because of the moderate and sufficient cam lobe resistance to push rod displacement. Other cam lobe configurations are being planned and developed to make sure that no possible trade-off to self-actuated mechanical oscillation is overlooked. Another possible approach to self-actuation for the magnetic disc drive is by the application of a twin level magnetic commutator which is directly connected to the disc drive shaft. The magnetic commutator segments alternately attract corresponding radial magnets on pull-rods which are pivoted on each of the oscillation plates of the magnetic pairs. While auto-actuation of the magnetic disc units may be desirable for some self-contained power applications, the low, fixed speed output is not considered attractive and promising for a wide range of household power applications. Because of the inflexibility of speed output of the auto-actuated type of unit the, the development of a variable speed, externally oscillated type of disc unit is required to meet the growing demand for alternate and auxiliary power means for many applications. The matching of a large magnetic disc drive and small solar powered DC electric motors is a nearly ideal arrangement since a single or series of small precision DC motors can be readily powered by modest arrays of silicon photovoltaic cells located at some convenient rooftop location. Small high-efficiency, ball bearing DC motors are available which, when connected to suitable gear reduction drives, can revolve a simple eccentric mechanism with sufficient power and variable speed, to cause oscillation of a series of four to six magnetic oscillating pairs of stator magnets. This series of magnetic oscillating pairs will all be connected together with straight linkage to transmit the reciprocating motion from the driving oscillating shaft to the other oscillating shafts of the series. This is a more desirable multiple driving arrangement rather than separate small DC motors since synchronism is automatically assured, rather than more complex and less reliable electrical synchronization requirements. Because there is no locked-in synchronism for this type of external oscillation means, the multiple magnetic oscillation pairs must be of the minimum interference type, in that they must not become jammed into the disc magnet segments. 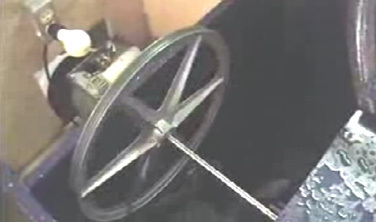 Although the proper functioning of the magnetic disc unit requires that the oscillating magnet pairs must enter the disc's magnet segment interference circle, deflection means must be added to all of the oscillation plates to insure that the continuously revolving disc will readily by-pass all of the oscillating magnet pairs. The large magnetic disc unit will consist of a basic non-magnetic circular disc, on which multiple high energy permanent magnet segments are equally spaced around the rim of the disc. The drive shaft of the disc rotates on precision ball-bearings and may be chosen to revolve in either a horizontal or a vertical plane. 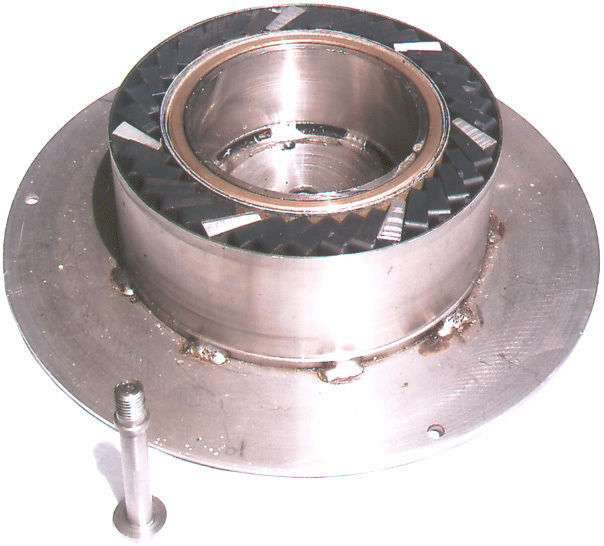 The disc is the driven component of the magnetic drive assembly, and it can be connected to the load or an electrical generator. The multiple oscillating magnet pairs are the driving component of the disc drive unit and consist of flat, non-magnetic oscillation plates, on which identical high-energy permanent magnets are secured at each end of these oscillating plates. The magnet segments are placed with opposite poles exposed at the sides, relative to each other so that a north-south pole couple reacts on the disc's magnet segments. The driven disc's direction of rotation depends on the polarity of the disc's magnets in relation to the oscillating magnetic pairs. The oscillating magnetic pairs will make a full back and forth oscillation between two adjacent local disc magnet segments so that an alternate "pull and push" effect is induced on the magnetic segmented disc. The basic synchronism between the disc's magnet segments and the multiple oscillating magnet pairs closely simulates the action of a watch or clock escapement mechanism in respect to the natural "cogging" action between the functioning components. This general magnetic disc drive arrangement insures smooth and continuous rotation for the driven disc with an optimum of magnetic energy interchange between the oscillation stations and the magnetic disc because of near pole face to pole face exposure. It is now believed that this present type of magnetic disc drive is approaching a theoretical maximum of conversion performance possible, especially when compared with other types of magnetic/mechanical arrangements such as magnetic worm and worm discs, spur couples, mitre couples, and all types of inferior, linear magnetic devices. The attractiveness of the basic magnetic disc and oscillating pairs is that a nearly ideal leverage factor is introduced in magnetic/mechanical conversion arrangements. Simply stated, considerably less energy is needed to oscillate the oscillating pairs than is produced from the near pole face to pole face magnetic interaction between the functioning magnetic components. The alternating and uniform "pull and push" force imposed by the oscillating magnet pairs on the disc magnet segments produces no direct back or counter force reaction on the driving oscillating magnet segments which is the master key for a useful and practical magnetic/mechanical conversion drive. The back or counter-reacting force on the oscillating magnet pairs is taken directly by the fixed pivots of the oscillation plates, with a minimum of load penalty imposed on the drive of the oscillating magnet pairs. All other types of rotary magnetic/mechanical conversion devices, with the possible exception of the worm and worm disc type, produce an undesirable back reaction force on the driving component and resulting ineffective performance. The magnetic worm and worm disc units have not proven to be sufficiently worthwhile for commercial applications because of the very high permanent magnetic energy necessary and due to the low speed output of these mechanisms. When configuration comparisons are made of all types of possible magnetic/mechanical conversion devices it will be noted that the combination of a magnetic disc driven by multiple oscillating magnet pairs will stand out as a practical and useful permanent magnetic conversion arrangement. The incentive for the development of this magnetic disc drive was the direct outgrowth of overall disappointing performance of solar energy conversion efforts and the frustrations encountered with component costs, conversion efficiency and a lack of suitable energy storage means. While solar energy is being widely hailed for its future potential as a viable alternate energy source, relatively few engineers speak out about relatively poor overall cost/effectiveness due to days-on-end of overcast skies during the winter months when the energy is most needed, especially in northern latitudes. Because of the less-than-adequate solar energy conversion outlook for the vast majority of American homeowners, other alternate, small scale, decentralised, energy sources must be explored and developed on a crash program basis. If this is not done within the next several decades we must accept the alternative of a greatly reduced standard of living because of the alarming rise in the rate of energy costs. This magnetic disc drive represents a practical solution in applying permanent magnetism in the development and commercialism of a decentralised, silent, fuel-free, household-sized alternate power system. While the power output from an individual magnetic disc unit may be small, the power output is constant and does not generally depend on the intensity of an external energy source, as do present solar energy systems. The magnetic disc drive unit is comprised of a large driving disc made of non-magnetic metal on which several permanent magnets are equally spaced around the rim. The disc drive shaft rotates on trunnion supported ball bearings and may revolve in nearly any conventional position, and may be constructed with any practical large diameter. The identical oscillating magnet pairs are the driving component of the disc drive and consist of flat, non-magnetic plates on which, pairs of identical permanent magnets are secured at both sides of the oscillation plates. These magnet pairs have opposite pole faces facing each other. The disc's direction of rotation is determined by the polarity of all the disc's magnets relative to the polarity of the oscillating magnet pairs. The oscillating pair of magnets make a full back and forth oscillation while each rotor disc magnet passes by. This produces a pull on the disc magnet as it approaches the oscillator magnet and then when the oscillator moves that magnet away, a push force is applied to the magnet on the rotating disc by the second magnet of the oscillating pair of magnets. The synchronisation of the disc and the oscillating magnet pairs must be maintained for continuous and smooth rotation of the disc. This movement is similar to the action of a clock escapement-mechanism. The method of moving the oscillating pairs of magnets is one or more solar-powered DC motors. These motors drive push rods which are in contact with ball bearings mounted on the oscillation plates. Since the eccentrics must move at relatively slow speeds, suitable gear reduction units must be used between the motors and the rocker arms. In order to maintain proper synchronisation of all of the oscillating components, straight links are used to connect all of the driven oscillation shafts to the driving oscillation shaft. Four or five oscillation stations can be driven from one driver oscillation shaft so that a disc drive with a large number of oscillation stations will require several D.C. motors to drive all of the other oscillation shafts. It is important that the multiple, identical oscillation plates and their magnet pairs be slightly shorter in width than the space between two adjacent disc magnet segments, so that an optimum pull and push force is induced on the local disc magnet segments. One side of the oscillating magnet couple "pulls" on the disc's permanent magnet and then the other oscillator magnet "pushes" the disc's permanent magnet onwards as it has been moved into place by the oscillation. All of the oscillating magnet pairs oscillate on stationary rods, or shafts, and all of the eccentrics and DC motor drives remain fixed on a base plate. The other ends of the oscillating rods or shafts must be supported by some form of bracket to keep the oscillation plates parallel to the disc magnet segments. Each eccentric which moves a ball bearing attached to arms on the oscillation plates must make one full 360 degree revolution within the angular displacement arc between two adjacent rotor disc magnet segments. Two small pivot brackets are attached to the extreme, non-magnetic ends of the oscillation plates to allow these plates to oscillate freely with a minimum of friction. The basic rotational relationship between the magnetic oscillating pairs, and the magnetic segmented disc, will have a bearing on the gear reduction ratio required for the gear drive unit coupled to the small DC motors. Fairly rapid oscillation is necessary to maintain a reasonably acceptable disc speed which will be required for most power applications. The size of the eccentrics which oscillate the oscillating magnet pairs will be determined by the full oscillating arc needed and the mechanical advantage required by the oscillation plate in order to cause the optimum rotation of the magnetic disc drive unit. Proper magnetic disc drive functioning requires the pulling magnets of the oscillating magnet pairs to enter the disc's interference circle within the mutual magnetic field zone between the two local interacting magnets on the disc's rim. Since the disc will revolve continuously, the withdrawing phase of the "pulling" magnets brings the "pushing" magnets of the couple into the disc's interference circle within the mutual magnetic field zone, for effective interaction with the adjacent disc magnet segment. All of the magnet segments on the oscillation plates which form the magnetic couples must be in line with the corresponding disc magnet segments in order to maintain an optimum interaction between them. Because there is no natural, lock-in synchronism for this type of magnetic disc drive, the multiple magnetic oscillating magnet pairs must be of the minimum interference type, which consists of adding plastic deflectors to the oscillation plates to prevent the pulling magnets of the couple from jamming into the disc magnet segments. Since the oscillating magnet pairs must never jam into the disc and stop its rotation, the plastic deflectors will allow the oscillation plates and magnet pairs to be deflected away from all of the disc magnet segments. The permanent magnets selected for both components of the disc drive must be uniformly identical and have the highest possible energy product or magnetic induction plus coercivity. Both of these magnetic properties will play a significant role in determining the true value of the magnetic disc drive unit. At the present time the rare-earth/cobalt permanent magnets offer the highest possible magnetic properties for this application, but their cost is very high and currently not considered cost effective for the magnetic disc drive. Since costs will also play a major role in the competitive value of the disc drive, the magnets selected must show the highest possible cost/effectiveness ratio, along with long operating life. Rectangular ceramic permanent magnets with large flat pole faces are preferred for the disc drive prototypes, and there is no theoretical limit to the size of both interacting components. A practical limit to the actual size of the components is imposed by weight and material cost restrictions plus available space, but nearly any practical number and size of uniformly identical magnets may be used to make up the magnetic disc drive. It will be advantageous to build up each disc magnet station into clusters of up to about twelve to twenty four individual magnets which are arranged in lengths of four or five units and double or triple widths depending on the disc diameter. A large diameter disc unit is always desirable since the torque output for the disc unit depends on the tangential magnetic force produced by all of the oscillating magnet couple stations multiplied by the disc radius. The large diameter disc speed will be relatively slow, in the 20 to 30 r.p.m. range, so that the disc output speed must be stepped up to a useful 750 to 1200 r.p.m. speed range, by a belt drive arrangement. The magnetic disc drive output is best adapted to run an electrical generator or alternator to produce electrical power for various household purposes. An advantage to using silicon photovoltaic solar cells on an exposed rooftop location as a power source, is that they are capable of providing a partial E.M.F. under non-sunlight/overcast sky conditions. With full sunlight exposure the electrical energy produced will run the magnetic disc drive at its maximum possible speed, with reduced sunlight levels producing a corresponding proportionate reduction in the disc output speed. A workable option exists for using a greater number of silicon photocells than would be normally necessary for full sunlight operation. The number of cells selected would be capable of running the magnetic disc drive at full speed under overcast sky conditions, with any excess full sunlight current bypassed to storage batteries. This option is a desirable arrangement since the disc will be assured of full electrical input power each day, with battery power available to make up the loss from any dark daytime sky conditions. The principal object of the invention is to provide the highest torque output for the large driven disc from the lowest possible torque input for the multiple oscillating magnet pairs, as a useful power step-up means for electrical generating applications. Another object of the invention is to provide a step-up power source which can be produced at competitive costs, requires no combustible fuel and is non-polluting while running silently and continuously. It is a further object of the invention to provide a natural energy source which has an extremely long operating life, with a maximum of operating effectiveness, component resistance to degradation, with a minimum of parts replacement and maintenance. The various features of the invention with its basic design geometry will be more apparent from the following description and drawings which illustrate the preferred embodiment. It should be understood that variations may be made in the specific components, without departing from the spirit and scope of the invention as described and illustrated. 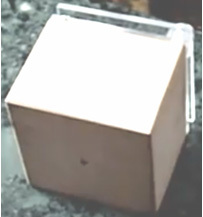 Fig.1 is a top, external view of the magnetic disc drive. Fig.2 is an external side view of the magnetic disc drive. Fig.3 is an enlarged top view of one oscillating magnet couple. Fig.4 is a top, break-away view of several oscillating magnet pairs connected together with linkage. The invention 1, is comprised of two basic components: a large driven disc 2, and multiple oscillating magnet pairs 3, which are closely interrelated and mounted on a common base plate 4. Multiple, identical permanent magnets 2a, are equally spaced around the periphery of the large driven disc 2, by means of support angles 2b, and angle brackets 2c, which are secured to the disc 2, with standard hardware. A drive shaft 5, is fastened to the disc 2, by means of a hub 2d, and supported by two ball bearings 6. One of the ball bearings 6, is fitted into a bore within the base plate 4, while the other ball bearing 6, is fitted into a box-base 7, which is fastened to the base plate 4, with standard hardware. The multiple oscillating magnet pairs 3, are a flat, non-magnetic plate 3a, with opposite pole magnet segments 3b and 3c, respectively, attached to the side of the flat oscillation plate 3a. Two pivot brackets 3d, are attached to the top and bottom of the flat plate 3a, which pivot the oscillation plate 3a, on the pivot rod 8. One end of the pivot rod 8, is fitted into the base plate 4, and the opposite end is supported by an elongated Z-shaped bracket 8a. An arm 9, is fastened to a flat face of the flat plate 3a, which supports the pin 10a, which carries the ball bearing 10, as it rolls on the eccentric disc 11. The off-centre disc 11, is fastened to the slow speed shaft of the gear reduction unit 12, which is driven by the small DC motor 13. A return tension spring 14, is connected to the oscillation plate 3a, by eyelet 3e. The opposite end of the return tension spring 14, is retained by the post 15, which is pressed into the base plate 4. Motors 13, are powered by multiple arrays of silicon photovoltaic solar cells 16. Electrical leads 16a, conduct solar converted electricity to the motors 13, with any excess current stored in the batteries 16b. The motor driven oscillation stations become the master stations for this invention 1, from which three to five slave oscillation stations are driven. The reciprocating motion is transmitted by straight links 17, which are pinned to the link arms 18, which in turn are secured to the flat plates 3a. All of the slave oscillation stations must be precisely adjusted to exactly the same angular position as the master driving oscillation station so that all stations are synchronised to allow proper functioning of the rotating disc 2. For very large discs 2, with many disc magnets, several master oscillation stations, with a fixed number of slave oscillation stations will be required. All of the master oscillation driving-stations will have to be electrically synchronised to maintain overall synchronisation, with all of the eccentrics 11, set at the same angle at start-up of the disc. Either end of the drive shaft 5, may be connected with a speed step-up belt drive arrangement, which is not shown here. Plastic deflectors 19, are added to either side of the oscillation plates 3a, adjacent to the opposite magnets segments 3b, and 3c, their exact position depending on the direction of rotation of disc 2. These act as an anti-jamming device for the magnets. Magnetic field bias angles 3f and 3g (Fig.3), are required for the sides of plates 3a, in order to assure an optimum "pull-push" sequence on the large drive disc 2, as the magnetic oscillation pairs 3, are actuated. The bias angle 3f, is matched to the magnet segment 3b, while bias angle 3g is matched to magnet segment 3c. None of the load components which are external to the device, such as an electric generator or alternator, are shown as a part of this invention, since a variety of load devices and arrangements are possible for the magnetic disc drive. The invention provides a magnetic repellent motor which comprises: a shaft (26) which can rotate around it's longitudinal axis, a first set (16) of magnets (14) arranged around the shaft (26) in a rotor (10) for rotation with the shaft, and a second set (42) of magnets (40) arranged in a stator (32) surrounding the rotor. The second set of magnets interacts with the first set of magnets, and the magnets of both sets are at least partially screened so as to concentrate their magnetic field strength in the direction of the gap between the rotor (10) and the stator (32). 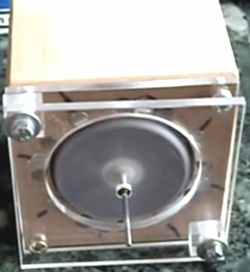 This invention relates to a magnetic repellent motor, or drive mechanism. Such a mechanism may be useful for driving an electrical generator, a vehicle, a ship, an aircraft, or the like. Conventional power sources rely on fossil fuels or secondary power sources such as nuclear power, or electricity derived by whatever means, for its source of driving power. All of these sources of power suffer from disadvantages such as being the cause of pollution, requiring transportation or transmission over long distances to the point of use, and being costly to purchase. Thus, there is a need for a power source which is substantially pollution-free in operation, requiring substantially no external power, and which is simple to maintain. This invention provides a magnetic repellent motor which comprises: a shaft which can rotate about its longitudinal axis, a first set of magnets which are arranged around the shaft and which rotate with the shaft, and a second set of magnets arranged in a stator surrounding the rotor, where the second set of magnets reacts with the first set of magnets, both sets being partially screen magnetically in order to direct their magnetic field into a gap between the two sets of magnets. Thus, the interaction of at least some of the magnets of the first and second sets urge the shaft to rotate. The interaction may be the net force of like magnetic poles repelling each other thereby urging the magnets away from each other, however, since only the rotor magnets can be moved by this urging force, the shaft is urged to rotate into a position where the repelling force is less. The rotor may be substantially disc-shaped and the first set of magnets may be located in a peripheral region of the rotor which rotates with the shaft. The stator may be in the form of a pair of arms aligned with the rotor. These stator arms can be moved relative to each other and away from the rotor, in order to allow the gap between the rotor and the stator to be set selectively. The gap may be set manually, for example, by a hand wheel, or automatically, for example by a system of weights which move centrifugally and so form a rotational speed control which acts automatically, i.e. the smaller the gap, the greater the repulsion forces between the magnets of the rotor and stator. Both the rotor and the stator may have more than one set of magnets. The magnets may be placed in sockets which extend towards the circumference of the rotor. These sockets may be substantially cylindrical and arranged in a plane which is perpendicular to the longitudinal axis of the rotor shaft. These sockets may also be arranged at an acute angle relative to the tangent to the circumference of the rotor disc where the mouth of the cylindrical socket is located. Similarly, the stator magnet sockets may be angled relative to the inner circumference of the stator. These angles may be between 18 degrees and 40 degrees, but preferably between 30 degrees and 35 degrees. These sockets may have a socket lining consisting at least partially of a magnetic screening material. The socket lining may line the entire extent of the sockets so that only the opening to the exterior remains unlined. In another embodiment of the invention, the magnetic screen lining may cover a substantial percentage of the whole of the socket lining, e.g. 50% of the socket lining. The magnets may be Nd-Fe-B of dimensions which fit snugly inside the linings of the sockets. These magnets may be cylindrical in shape and have a 37 mm diameter, a 75 mm length and a magnetic strength of 360,000 gauss. The socket lining, magnetic shield and magnet may all have a hole through them to receive a securing pin, preferably positioned so that it is parallel to the longitudinal axis of the shaft. The number of sockets in the rotor and the corresponding stator may differ so that there is not a one-to-one relationship between the sockets in the rotor and the sockets in the corresponding stator. Similarly, the number of magnets in any additional rotor/stator sets may differ from the first rotor/stator sets in order that the two sets are out of register at any given time. Some sockets may be left empty in either the rotor or the corresponding stator, or both. The motor may have one or more rotor/stator pairs of this type arranged in a stack. It is preferable for the magnets of adjacent rotors to be out of register, i.e. staggered or offset relative to each other. Fig.1 is a perspective view which shows one rotor disc. Fig.2 is a perspective view showing a stack of the Fig.1 rotors in an assembled arrangement. Fig.3 is a perspective view showing a left arm of a stator. Fig.5 is a perspective view showing a stack of the stators or Fig.3 and Fig.4 in an assembled arrangement. Fig.6 is a perspective view showing a socket lining of a stator or a rotor. Fig.7 is a perspective view showing one of the magnets. 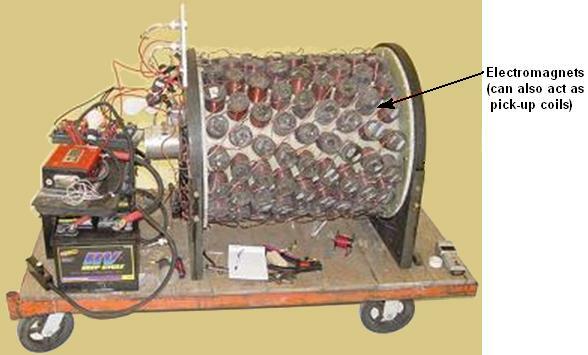 Fig.8 is a perspective view showing one embodiment of the magnetic repellent motor coupled to an electrical generator. of a first set 16 of magnets. The receiving zones 12 are in the form of circumferentially extending, spaced apart, and substantially cylindrical sockets 18 which are located in a plane which is perpendicular to the rotational axis 10 of the rotor and in a peripheral region of the disc. In the region of the sockets 18, the rotor 10 also has through holes 20 in it's side surfaces 22, extending parallel to the rotational axis of the rotor. The rotor 10, also has a centre hole 24, to receive shaft 28 which is shown in later figures. The sockets 18, are preferably angled at an acute angle relative to the tangent to the circumference of the rotor disc 10, at the mouth opening of the sockets 18. Ideally, this angle is between 18 and 40 degrees, and preferably between 30 and 35 degrees. In one particularly preferred embodiment, the angle is 34 degrees. As shown in Fig.2, the sockets 18, receive (or incorporate) a socket lining 28 (shown in more detail in later figures) which is at least partially made of a magnetic screening material, whether metallic or non-metallic, for example, graphite. The socket lining 28, covers the entire extent of the sockets 18, so that only the opening to the exterior remains uncovered. In the rotor assembly 30 of Fig.2, three rotors discs 10, have been stacked in a row on the shaft 26. The connection between the rotor discs 10 and shaft 26, as well as between the rotor discs themselves, can be established via linking means which are widely known. In general, the motor may have any number of rotor discs 10, and corresponding stators 32, since the effect of using several rotor discs 10 in parallel, is cumulative. However, it may be useful for smooth operation of the motor 1, to arrange the rotor discs 10 so that the magnets of adjacent rotor discs are staggered, or offset relative to each other. Referring to Fig.3 and Fig.4, a stator 32 is shown. This stator is made of a non-magnetic material. The left arm 34, and the right arm 36, combine to form the stator 32. Each of the arms, 34 and 36, has a substantially semi-circular shape and is sized so as to enclose the corresponding rotor disc 10 in the radial direction, while still leaving a gap between the stator 32 and the rotor disc 10. The arms 34 and 36 of one stator 32, can be moved relative to each other and their corresponding rotor disc 10, so that the gap between the arms and the rotor disc can be set at different values. The stator 32 has several magnet receiving zones 38, ready to accept the magnets 40, (which are shown in a later figure) of the magnet set 42. These receiving zones are again in the form of circumferentially extending, substantially cylindrical sockets 44 which are positioned in a plane which is perpendicular to the longitudinal axis of shaft 26. In the region of the sockets 44, the stator 32 has through holes 46 arranged in it's side surfaces 48, these holes extending parallel to the longitudinal axis of the shaft 26. These sockets 44 are again angled at an acute angle relative to a tangent to the inner circumference of the stator 32 at the mouth opening of the sockets 44. This angle is preferably between 18 and 40 degrees and more preferably, between 30 and 35 degrees. The angle of the sockets 18 and 44, and the relative positioning between them, has to be adjusted to allow for a good performance of the motor. Fig.5 shows a stator assembly consisting of three stators designed to fit the rotor assembly of Fig.2. As described with reference to the sockets 18 of Fig.2, the sockets 44 receive (or incorporate) a socket lining 50 (shown in more detail in later figures), which is at least partially made of a magnetic screening material. The socket lining 50, covers the entire extent of the sockets 44 so that only the opening to the exterior remains uncovered. Referring to Fig.6, a socket lining 28, 50 of the rotor disc 10, or the stator 32, is shown in more detail. The socket lining 28, 50 is formed to fit into the sockets 18, 44 and may be made completely of a material which has magnetic screening properties. In one preferred embodiment, the socket lining 28, 50 is made of diamagnetic graphite and is partially surrounded by an additional shield 52 of a material having strong magnetic screening properties, e.g. stainless steel. In the embodiment shown in Fig.6, the shield 52 surrounds about 50% of the socket lining surface. Thus, by at least partially covering the sockets 18, 44 with a magnetic screening material, the magnetic field of the inserted magnets 14, 40 is, so to say, focussed axially with the socket 18, 44, rather than dissipated about the magnets. Further, holes 54 through the socket linings 28, 50 are provided and these correspond to the through-holes 20 and 46 in the rotor disc 10 and the stator 32, respectively. Thus, a retaining pin 56 may be inserted after magnet 14, 40 has been put in socket 18, 44 to make a detachable fixing for magnet 14, 40 to the socket lining 28, 50 and the socket 18, 44 so as to prevent expulsion of the magnetic sources during operation. Fig.7 shows a typical magnetic source 14,40 used in this motor design. The magnetic sources 18, 40 may be natural magnets, induced magnets or electromagnets. The magnetic source for example, is a Nd-fe-B magnet which has the necessary dimensions needed to fit neatly into socket 18, 44 and socket lining 28, 50, respectively. In one preferred embodiment, the magnetic source 18, 44 is a substantially cylindrically shaped magnet with a diameter of 37 mm, a length of 75 mm and provides 360,000 gauss. 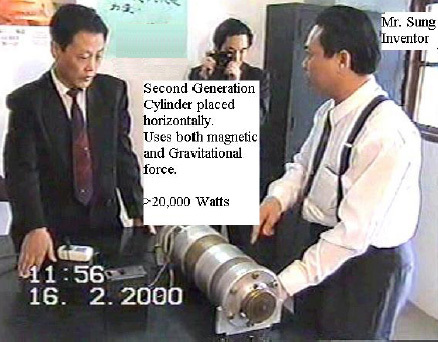 However, the magnetic source 18, 44 may be shaped differently to cylindrical and may have different characteristics. In any case, the magnetic source 18, 44 must have a through-hole 58 to receive the retaining pin 56. The magnet motor shown in Fig.8 is mounted on frame 60 and is coupled to an electrical generator 62. In this specific embodiment, the motor has three rotor discs 10 of the type already described. These are mounted on a single rotating shaft 26 and are driven by three stators 32, as already described, causing shaft 26 to rotate about it's longitudinal axis. Shaft 26 may be connected to a gearbox in order to gain a mechanical advantage. The stator arms can be moved by a stepper motor 64. The number of sockets in the rotor discs 10 and their corresponding stators 32 may differ so that there is not a one-to-one relationship between the sockets 18 in the rotor disc 10 and sockets 44 in the corresponding stator 32. Similarly, the number of magnetic sources in the stator 32 and the rotor disc 10 may differ so that a proportion of the magnetic sources 14, 40 are out of register at any given time. Some sockets may be empty, i.e. without a magnetic source, in either the rotor disc 10 or the stator 32, or both. The sockets 18 of the rotor discs 10 can be staggered, i.e. offset relative to the sockets of adjacent rotors, or they can line up in register. Thus, the magnet motor may be time-tuned by the relative positioning of the magnetic sources 14 of adjacent rotor discs 10. Thus, the interaction of at least some of the magnetic sources 14, 40 of the first and second set 16, 42 urges the shaft 26 to rotate. Once the shaft begins to rotate, the plurality of simultaneous interactions causes shaft 26 to continue rotating. As mentioned before, the motor can have any number rotor discs 10 and corresponding stator sets 32. Although the precise adjustment of the motor elements is important, one may imagine other embodiments covered by this invention.